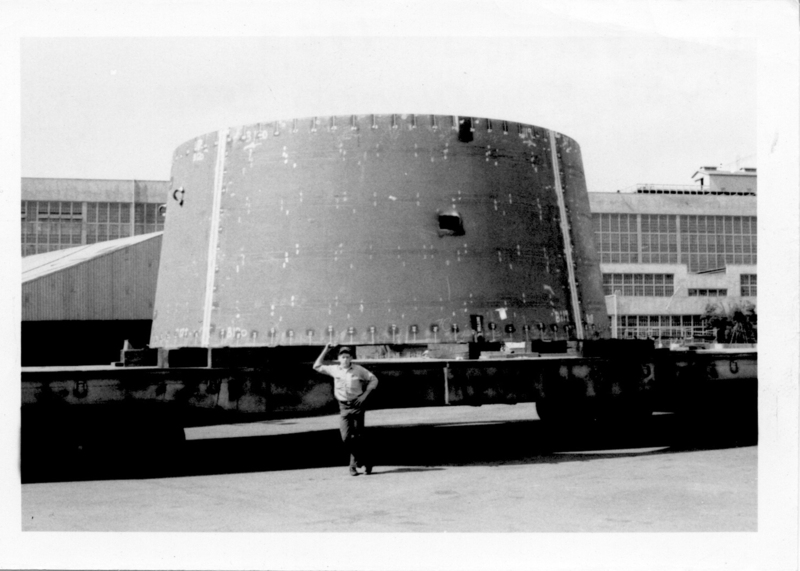 Benjamin Franklin Class Ballistic Missile Submarine: Laid down, 2 May 1963, at Mare Island Naval Shipyard, Vallejo, CA. 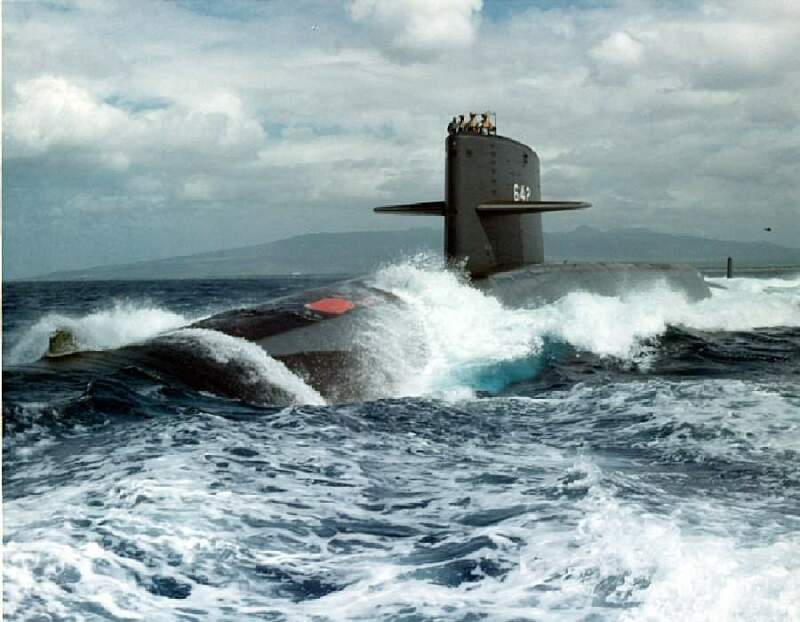 ; Launched, 16 January 1965; Commissioned, Kamehameha (SSBN-642), 10 December 1965; Reconfigured for special warfare operations and re-designated, Attack Submarine (SSN-642), in July 1992; Decommissioned and struck from the Naval Register, 2 April 2002; Final Disposition, undergoing disposal through the NPSSRP (Nuclear Powered Ship and Submarine Recycling Program) at Puget Sound Naval Shipyard, Bremerton, WA. SSBN Specifications: Displacement, Surfaced: 7,325 t., Submerged: 8,251 t.; Length 425'; Beam 33'; Draft 29'; Speed, Surfaced 16 kts, Submerged 21 kts; Depth limit 1,300'; Complement 140 (each crew, blue and gold); Armament, 16 missile tubes; four 21" torpedo tubes, forward, MK 14/16 Anti-ship Torpedo MK 37 Anti-Submarine Torpedo, MK 45 ASTOR Nuclear Torpedo MK 48 Anti-Submarine Torpedo; Combat Sensors, BPS-11A or BPS-15 surface-search radar, BQR-7 sonar, BQR-15 towed-array sonar, BQR-19 sonar, BQR-21 sonar, BQS-4 sonar Propulsion, S5W nuclear reactor two geared steam turbines, 15,000 SHP, one propeller. 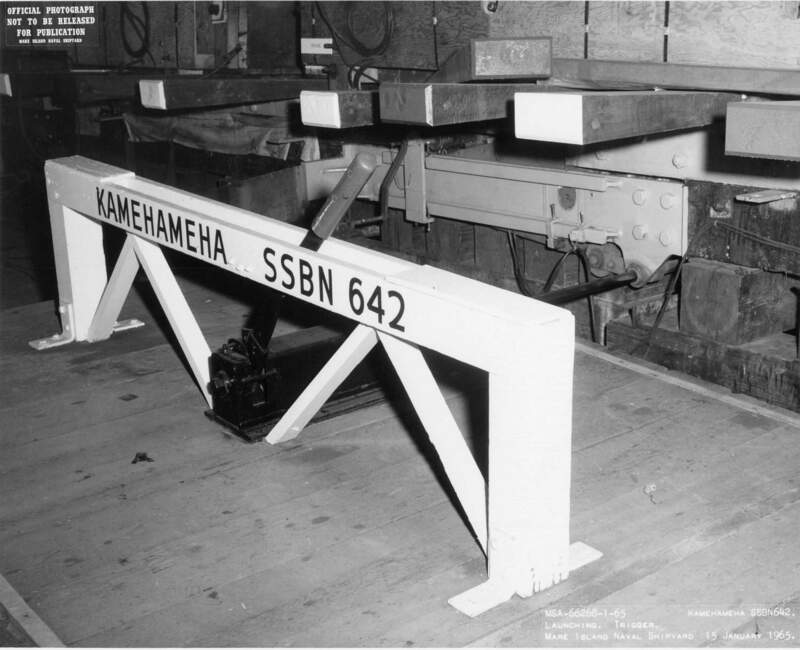 145k The plate marking the keel laying of the Kamehameha (SSBN-642) at Mare Island Naval Shipyard on 2 May 1963. 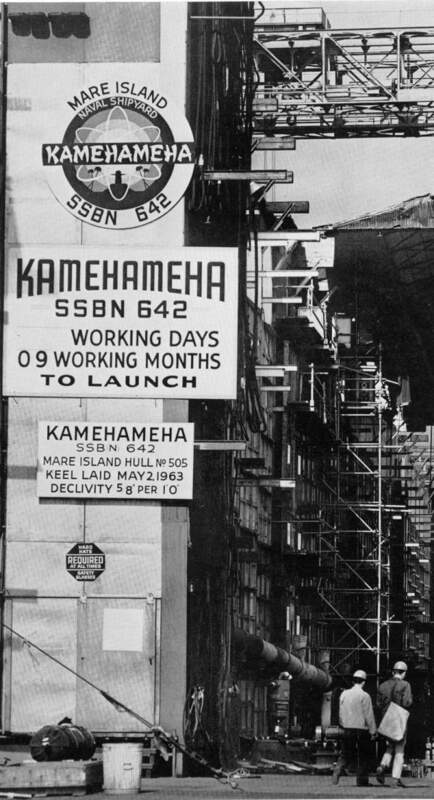 The hull was not named Kamehameha until 10 May 1963. USN photo # MSA 58912-5-63, courtesy of Darryl L. Baker. 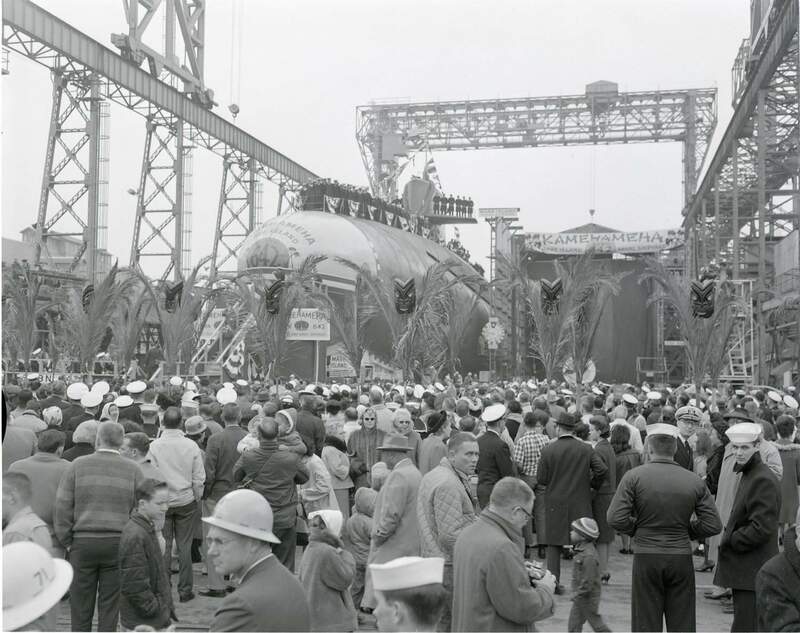 155k A photo of the keel laying party for the Kamehameha (SSBN-642) at Mare Island Naval Shipyard on 2 May 1963. From left to right: Capt. 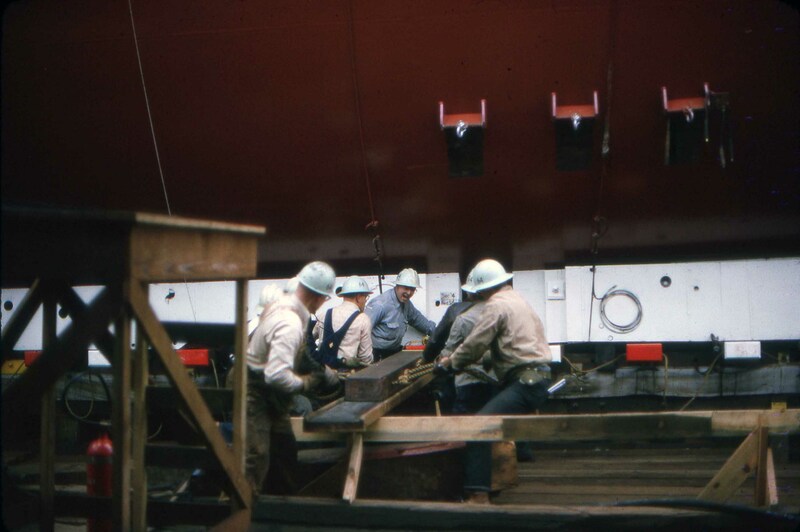 Paul F. Straub (Shipyard Production Officer); Keel-layers Guido J. Rosati (Head, Industrial Hygiene) and George L. Morgan (Quarterman Stockman, Supply Dept. 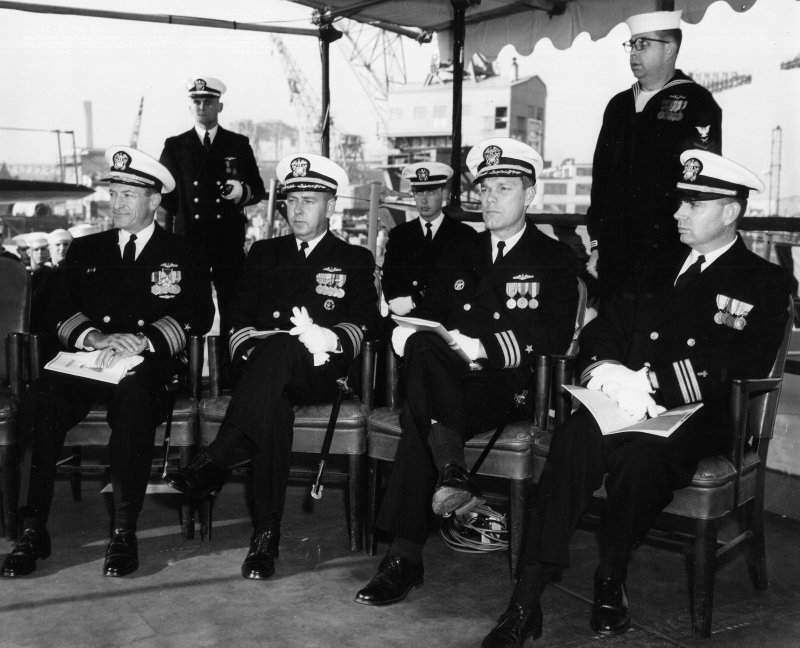 ); RADM Edward J. Fahy (Shipyard Commander); Keel-layers Wayne G. Scott (Master Welder) and Sam Inzalaco (Master Painter); and LCDR McLAugust hlin. 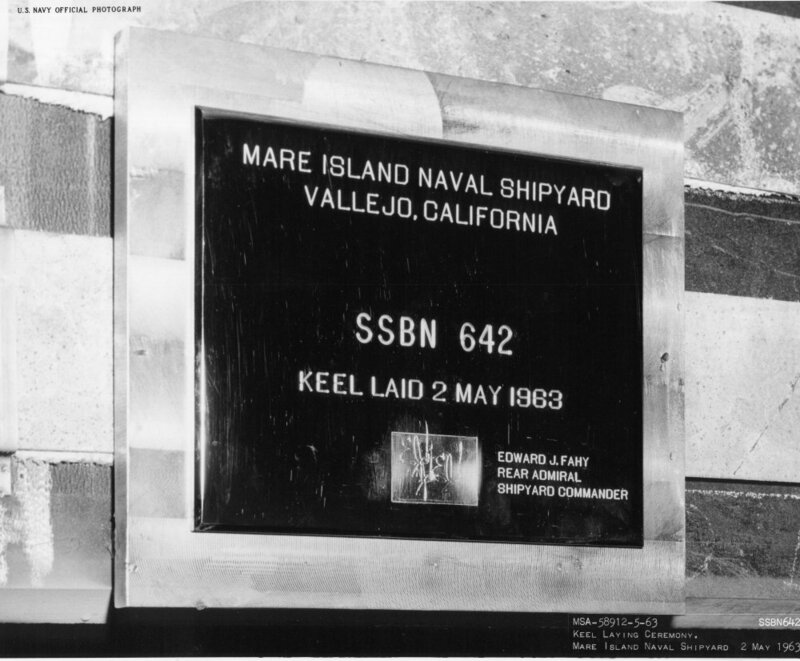 (Note that the ship's name does not appear on the sign in the background since the hull was not named until 10 May 1963). USN photo # MSA 58913-5-63, courtesy of Darryl L. Baker. 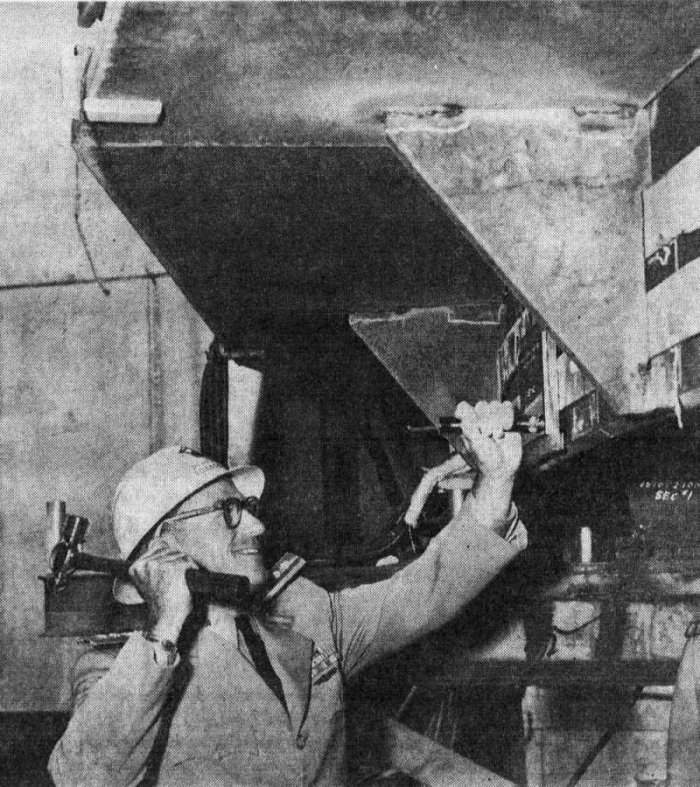 91k RADM Edward J. Fahy (Shipyard Commander) stamps his initials on keel plate of the (SSBN-642) at Mare Island Naval Shipyard on 2 May 1963. The entire keel-laying ceremony required only six minutes. USN photo courtesy of Darryl L. Baker. 186k Bow view of the Daniel Boone (SSBN-629) on the building ways just prior to her launching at Mare Island on 22 June 1963. Note: Kamehameha (SSBN-642) is under construction on the ways to the left. USN photo contributed by Darryl L. Baker. 642k Kamehameha (SSN-642) hull section taken at Mare Island in 1963. 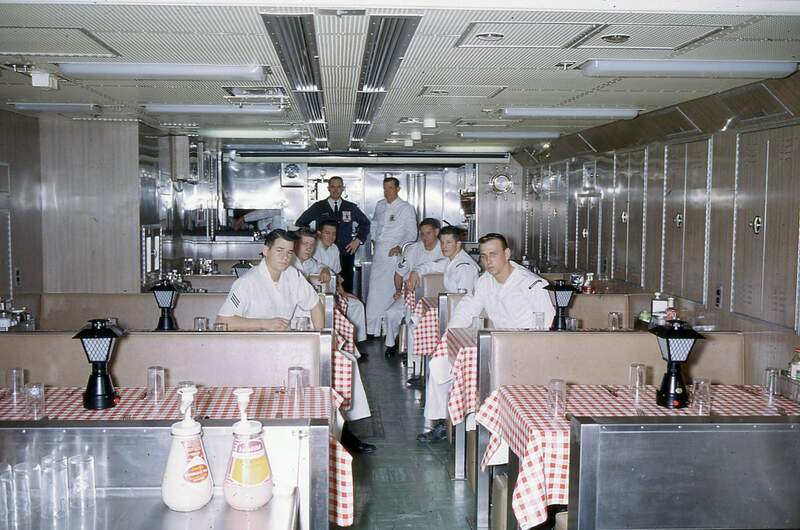 Sailor standing is EM3 Decker, a shipmate from the Rasher (AGSS-269) that was in overhaul. Photo courtesy of Bob Mhoon, ETCS(SS), COB Guittaro SSN-665. 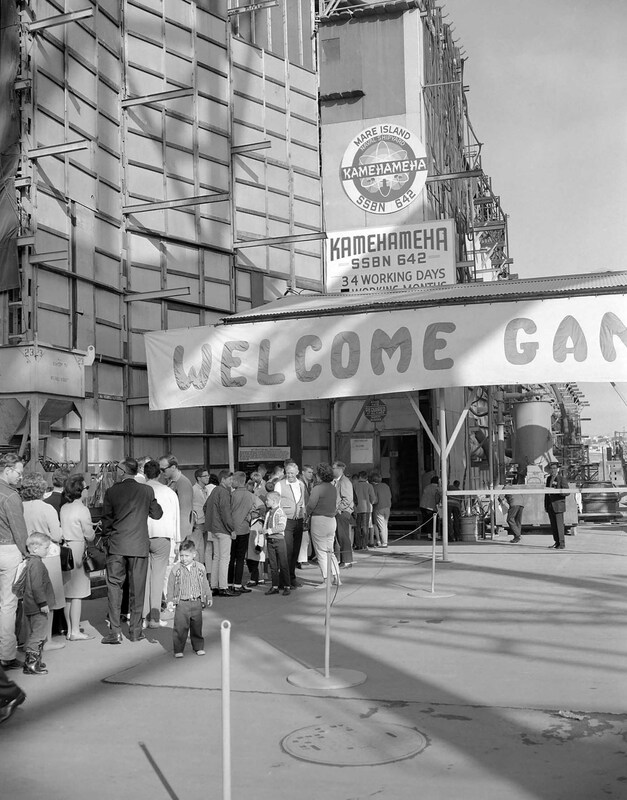 320k Civilian shipyard employees and their families lineup outside the construction shed of the Kamehameha (SSBN-642) at Mare Island Naval Shipyard on 29 November 1964. Note the sign indicating that there are 34 working days until the submarine's launching. USN photo # 65624-12-64 TH, from the files of the Vallejo Naval & Historical Museum, courtesy of Darryl L. Baker. 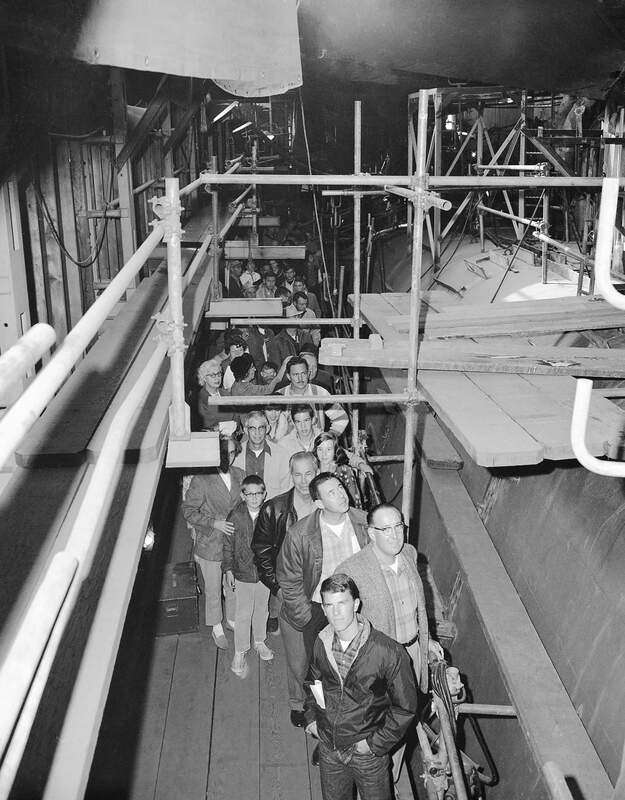 537k Civilian shipyard employees and their families view the hull of the Kamehameha (SSBN-642) in her construction shed at Mare Island Naval Shipyard, on 29 November 1964. 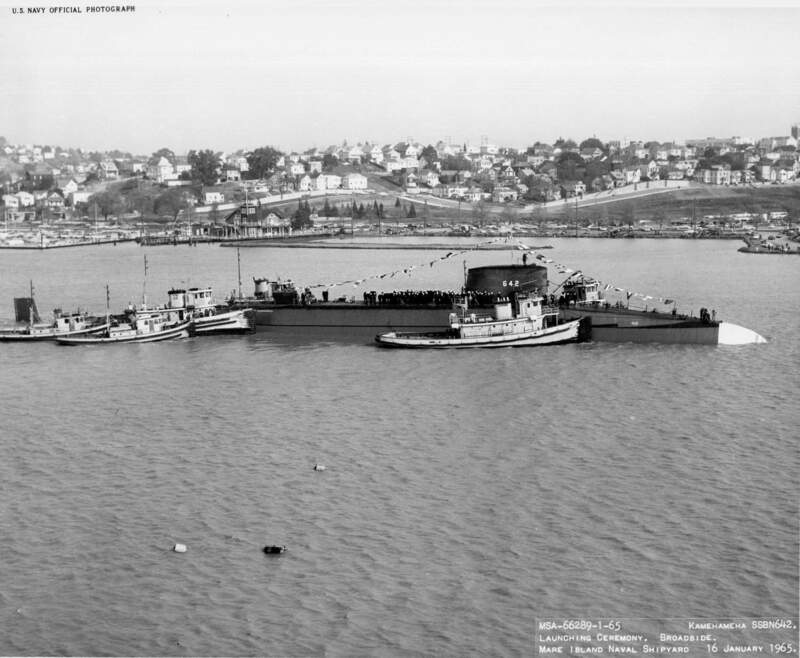 USN photo # 65626-12-64 TH, from the files of the Vallejo Naval & Historical Museum, courtesy of Darryl L. Baker. 210k This photo appeared in the 11 December 1964 issue of Mare Island's newspaper the "Grapevine". 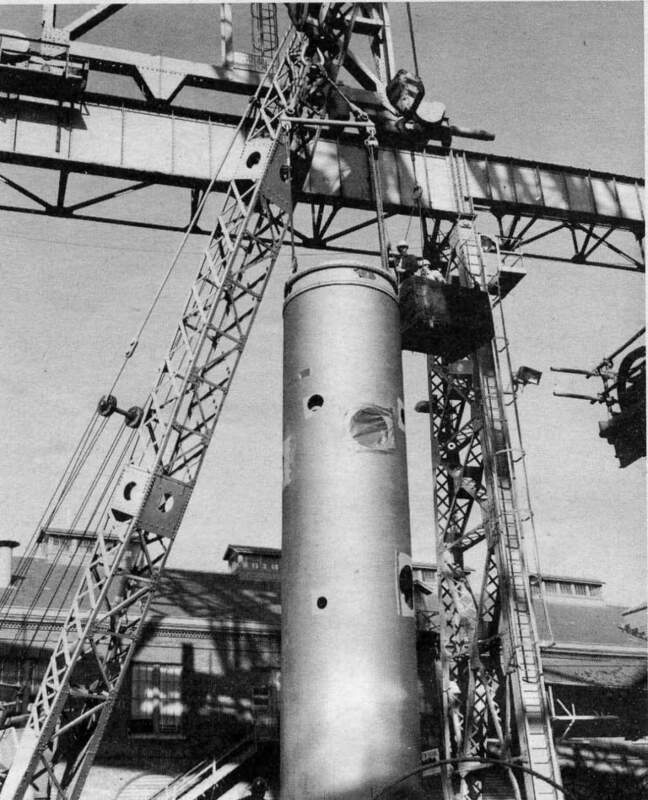 Caption reads: "Another Polaris missile launch tube assembly is rigged for landing aboard Kamehameha (SSBN-642). Next week the last of 16 such will be in place on the "the 642" a full month before the submarine slides down the building ways. 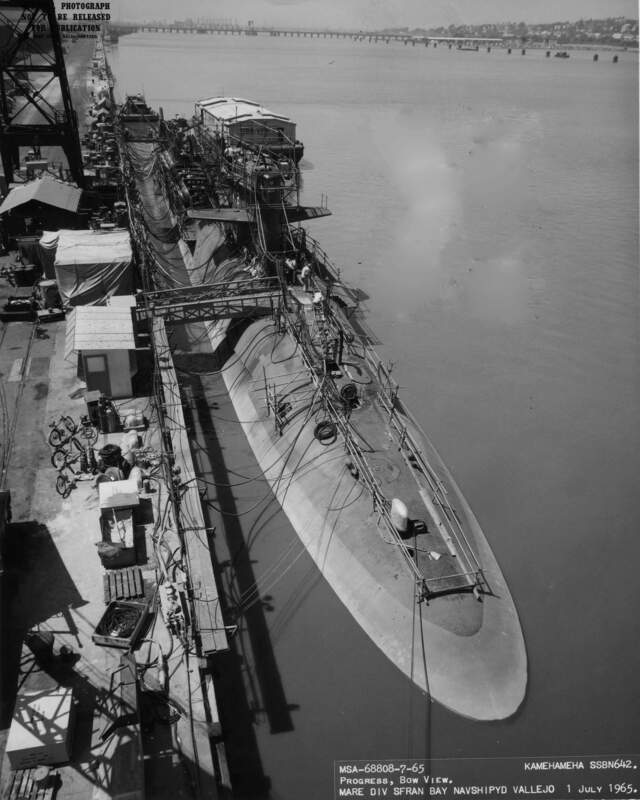 Although the Yard has launched FM subs with all of the old-type :inner tubes" aboard, this ship will be the first to have all 16 of the foam-cushioned assemblies when she leaves the ways". USN photo courtesy of Darryl L. Baker. 172k This photo of the building shed for Kamehameha (SSBN-642) at Mare Island Naval Shipyard circa 1964 appeared in the North American Aviation, Inc. Magazine "Skyline" Vol. 22, Number 3 in 1964. USN photo courtesy of Darryl L. Baker. 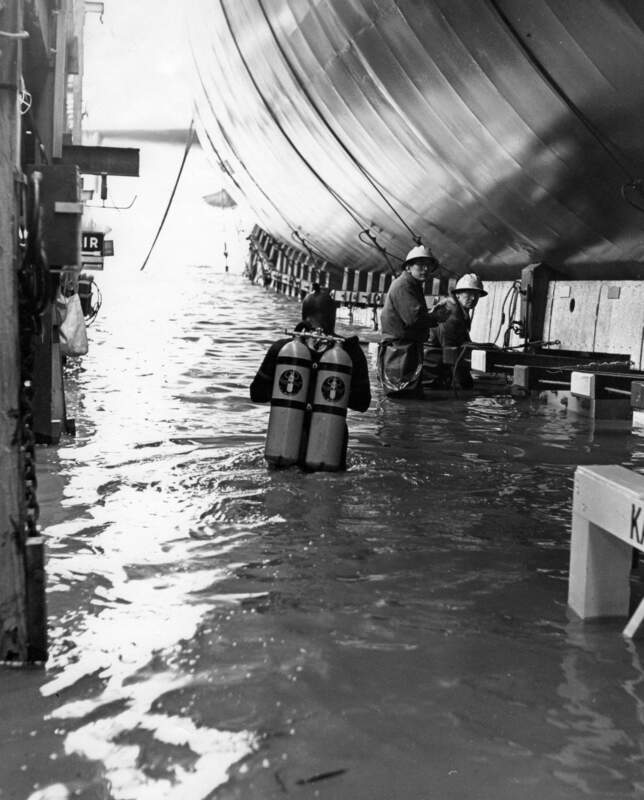 974k Diver and shipwrights checking the launching cradle of Kamehameha (SSBN-642) prior to her launching at Mare Island. USN photo # MSA 66254-1-65,courtesy of Darryl L. Baker. 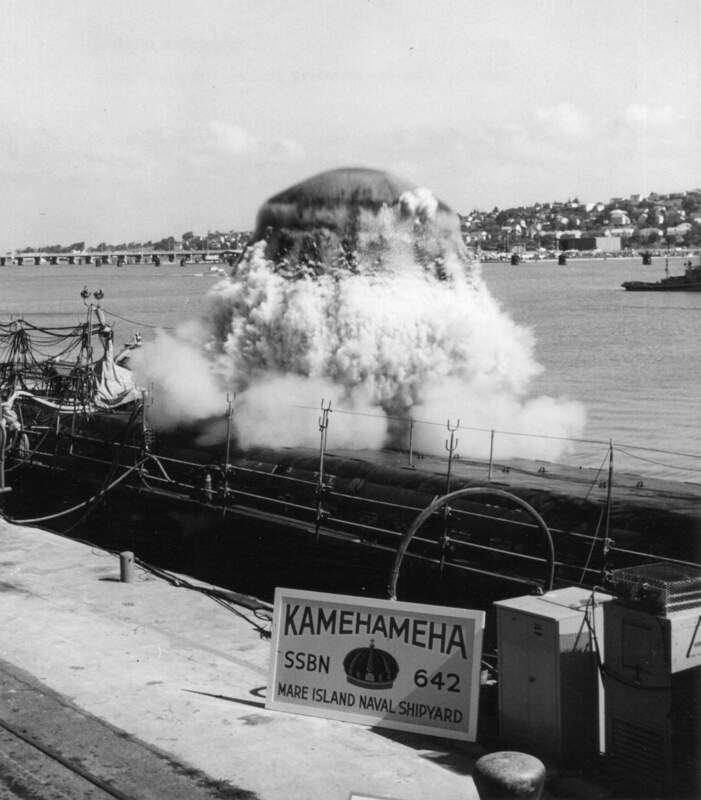 5.40k PDF of the Kamehameha's (SSBN-642) launching. USN photo courtesy of Darryl L. Baker. 339k A bow view of the Kamehameha (SSBN-642) taken on 15 January 1965, being prepared for launching on following day at Mare Island Naval Shipyard. USN photo # MSA 66266-1-65,courtesy of Darryl L. Baker. 172k A view of the forward poppet of the launch cradle for the Kamehameha (SSBN-642) on 15 January 1965 at Mare Island Naval Shipyard. USN photo # MSA 66267-1-65,courtesy of Darryl L. Baker. 165k The Kamehameha (SSBN-642) launch trigger. Photo taken 15 January 1965 at Mare Island Naval Shipyard. USN photo # MSA 66268-1-65, courtesy of Darryl L. Baker. 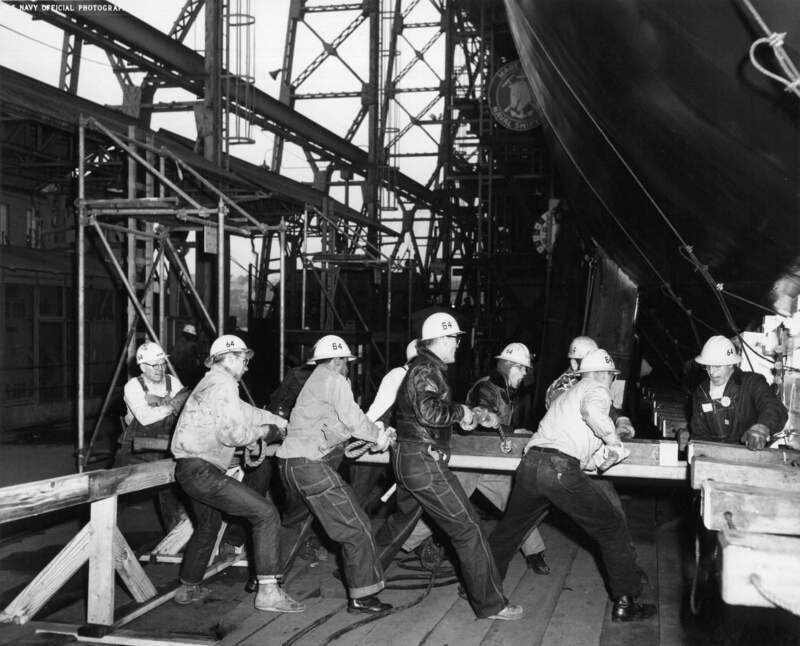 188k Mare Island Naval Shipyard Shipwrights are shown preparing for the launching of the Kamehameha (SSBN-642) on 15 January 1965. USN photo # MSA 66260-1-65, courtesy of Darryl L. Baker. 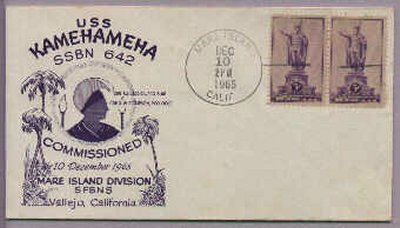 48k Commemorative postal cover marking the launching of the Kamehameha (SSBN-642) at Mare Island Naval Shipyard on 16 January 1965. USN photo courtesy of Darryl L. Baker. 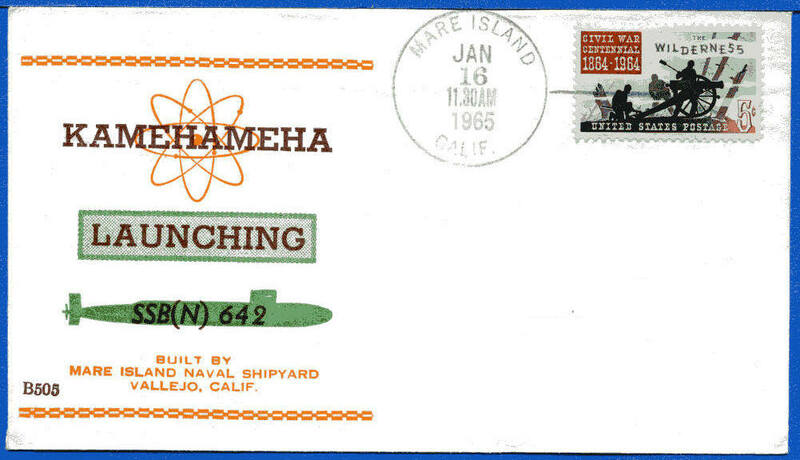 90k Commemorative postal cover marking the launching of the Kamehameha (SSBN-642) at Mare Island Naval Shipyard on 16 January 1965. Courtesy of Jack Treutle (of blessed memory). 196k Kamehameha (SSBN-642) just prior to her launching at Mare Island Naval Shipyard on 16 January 1965. USN photo courtesy of Darryl L. Baker. Photo scanned from original negatives courtesy of By Design, Benicia, CA. 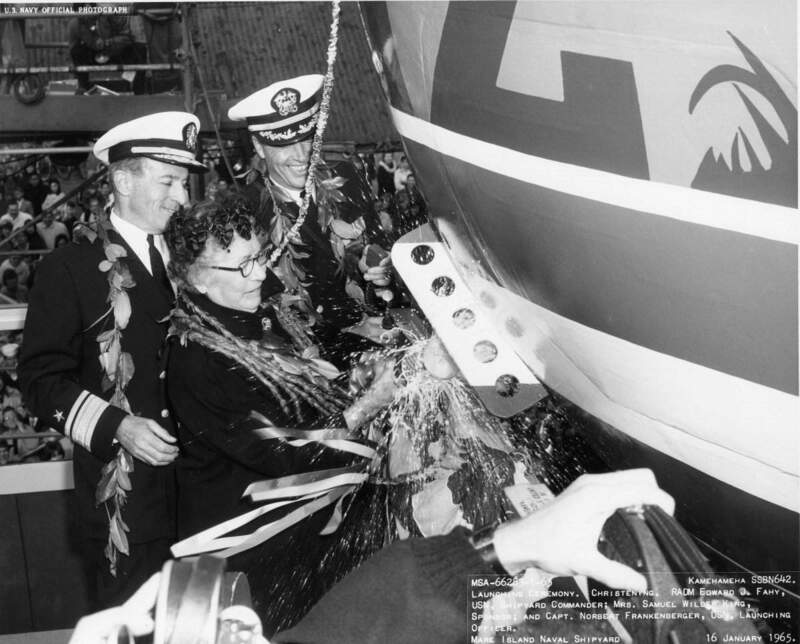 127k Mrs. Samuel Wilder King, Sponsor of the Kamehameha (SSBN-642) is shown christening the ship at Mare Island Naval Shipyard on 16 January 1965. Assisting her are RADM Edward J. Fahy, Shipyard Commander, (left) and Capt Norbert Frankenberger, Shipyard Production Officer. USN photo # MSA 66283-1-65,courtesy of Darryl L. Baker. 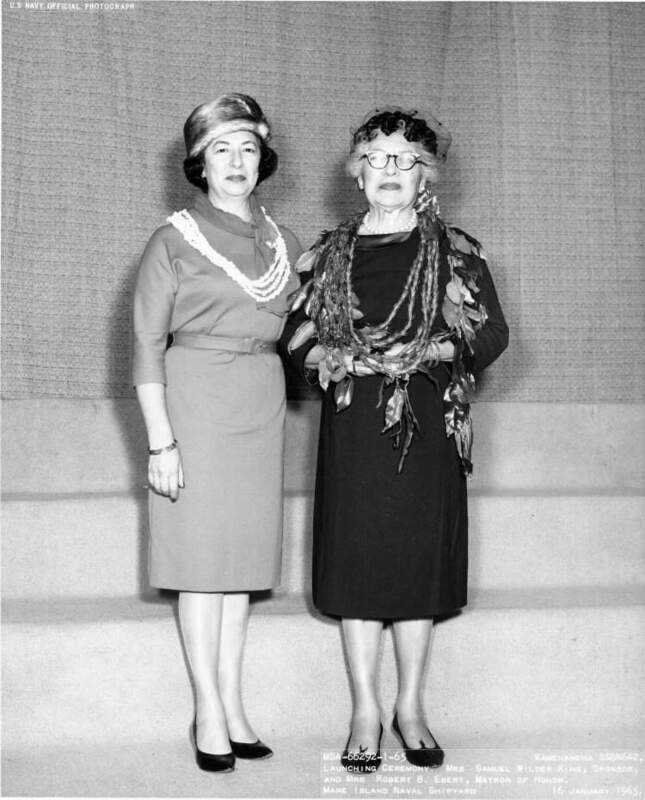 80k Mrs. Samuel Wilder King, Sponsor of the Kamehameha (SSBN-642) is shown with the Matron of Honor Mrs. Robert B. Ebert at the reception marking the ship's launching at Mare Island on 16 January 1965. USN photo # MSA 66292-1-65,courtesy of Darryl L. Baker. 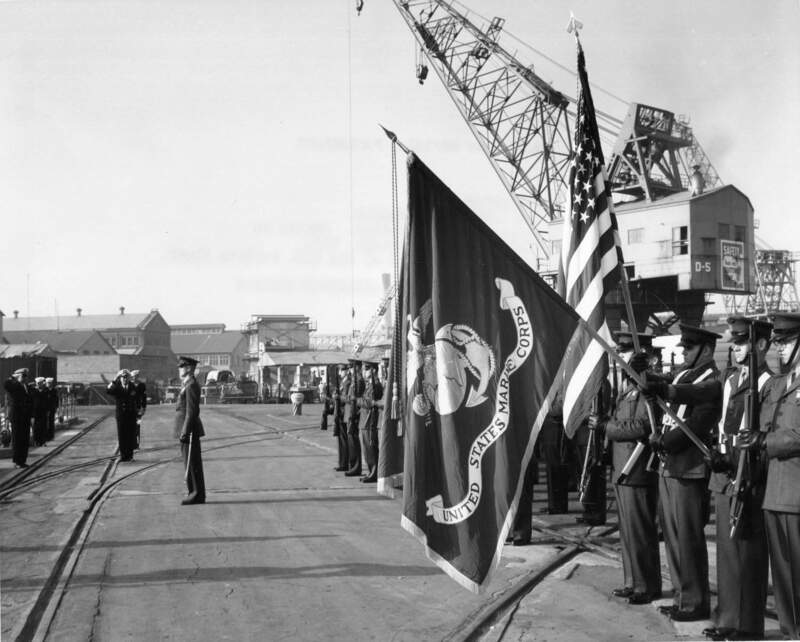 177k Honors are rendered to Senator Daniel K. Inouye at Mare Island Naval Shipyard on 16 January 1965. 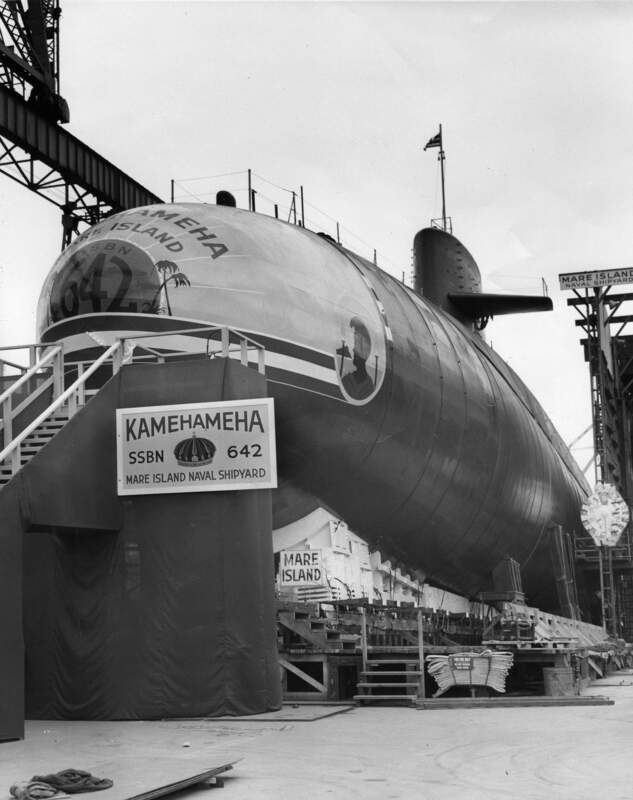 The Senator was a speaker at the launching of the Kamehameha (SSBN-642). Note the tropical decorations in the ceremony area. USN photo # MSA 66273-1-65,courtesy of Darryl L. Baker. 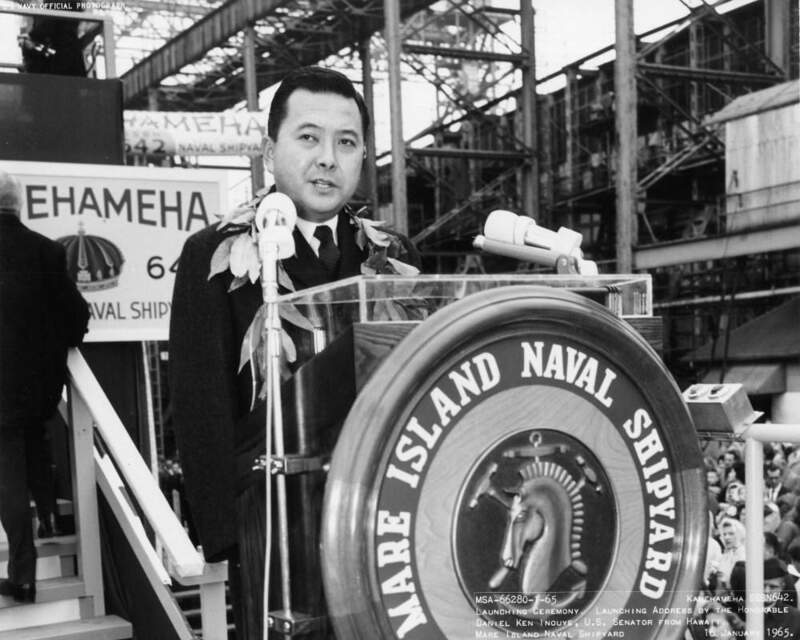 92k Senator Daniel K. Inouye (Hawaii) was one of the guest speakers at the launching of the Kamehameha (SSBN-642) at Mare Island Naval Shipyard on 16 January 1965. USN photo # MSA 66280-1-65,courtesy of Darryl L. Baker. 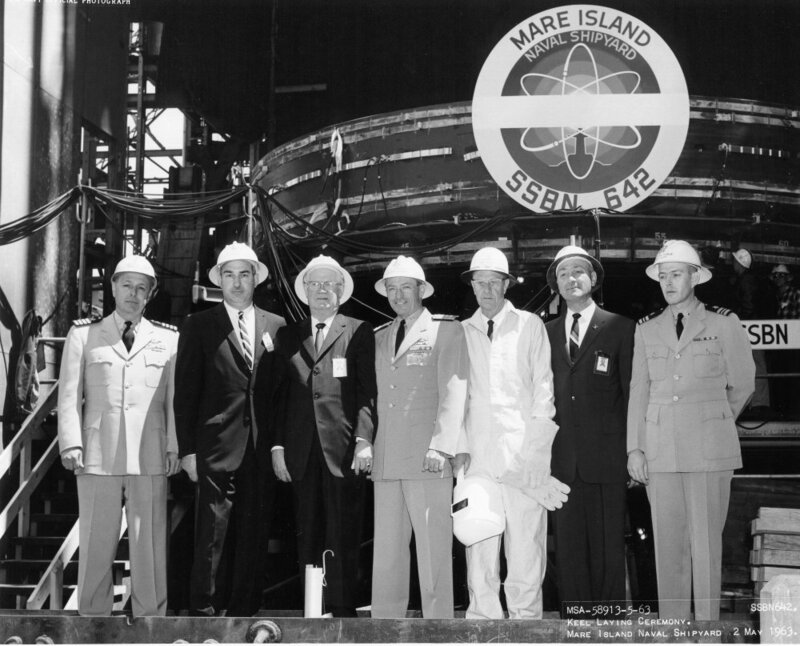 122k RADM Edward J. Fahy, USN (Shipyard Commander), RADM Eugene B. Fluckey, USN (Commander Submarine Force, Pacific), RADM Richard H. O'Kane, USN (Ret), and Capt George L. Street, III are shown at the launching reception for the Kamehameha (SSBN-642) at Mare Island on 16 January 1965. 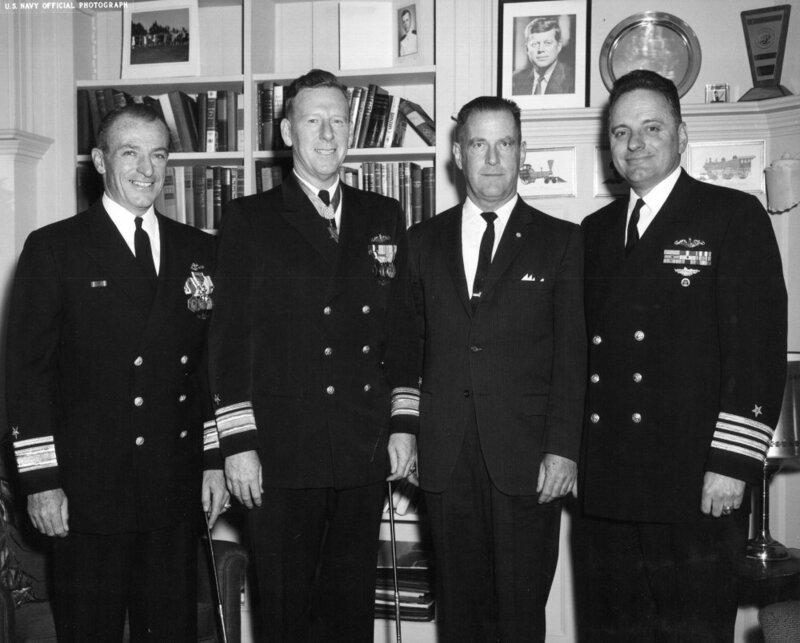 Admirals Fluckey and O'Kane and Capt Street are noted World War II submarine commanders. USN photo # MSA 66300-1-65,courtesy of Darryl L. Baker. 803k Kamehameha (SSBN-642) is seen on the morning of her launching at Mare Island on 16 January 1965. USN photo # MSA 66321-1-65, courtesy of Darryl L. Baker. 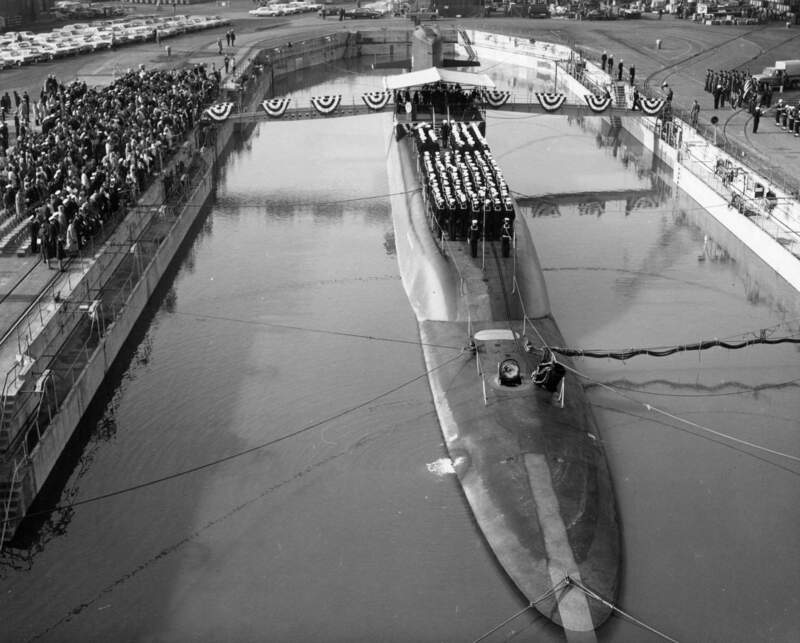 1.40k Mrs. Samuel Wilder King (Ship's Sponsor) is prepared to christen the Kamehameha (SSBN-642) at Mare Island Naval Shipyard on 16 January 1965. 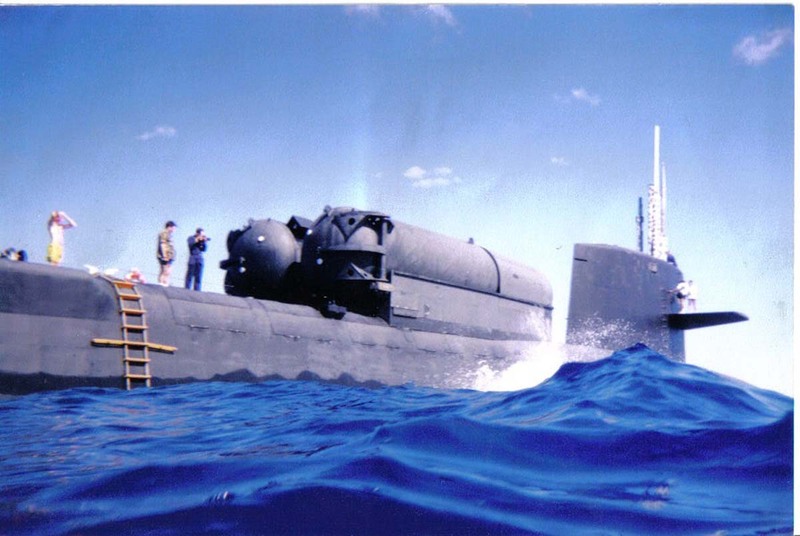 Kamehameha was the yard's sixth Polaris and 11th nuclear-powered submarine. 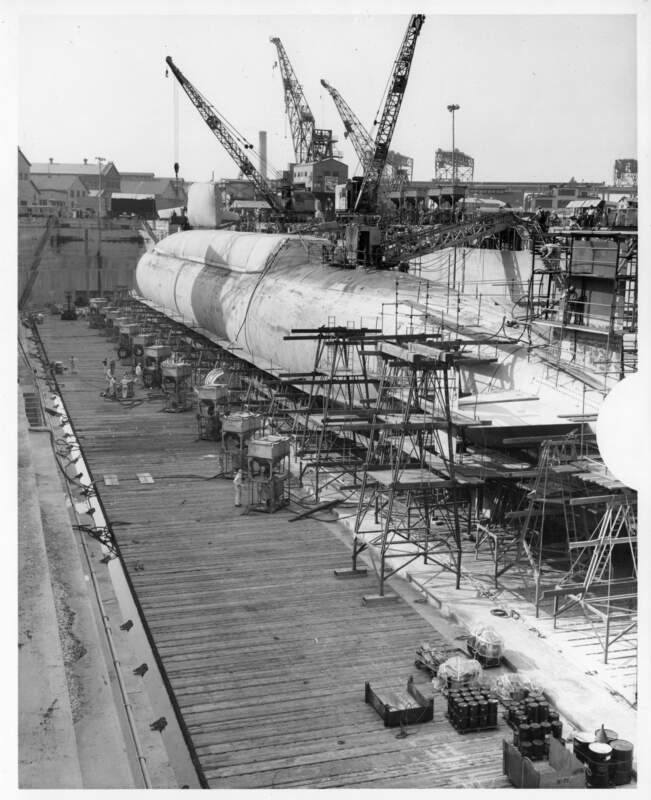 The hull of the Gurnard (SSN-662) being constructed on the ways to the right. USN photo # MSA 66282-1-65,courtesy of Darryl L. Baker. 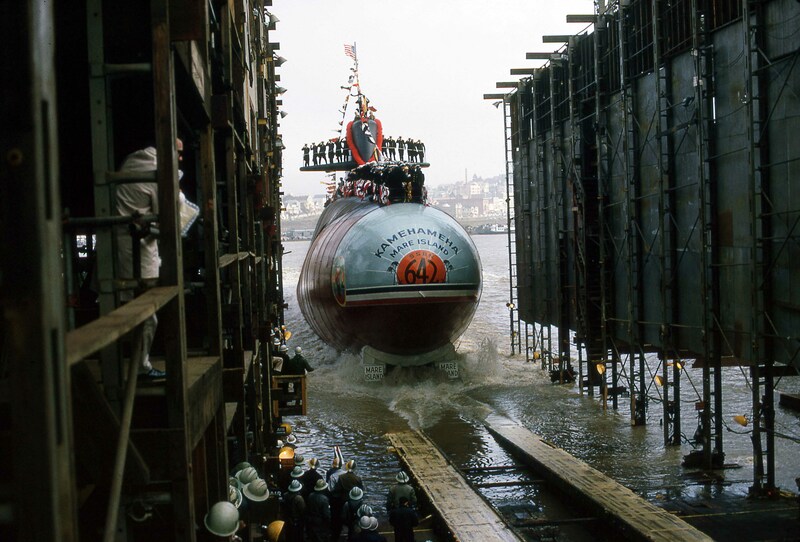 455k Mrs. Samuel Wilder King (Ship's Sponsor) is prepared to christen the Kamehameha (SSBN-642) at Mare Island Naval Shipyard on 16 January 1965. USN photo # MSA 66282s-1-65,courtesy of Darryl L. Baker. 291k The Kamehameha (SSBN-642) is half way down the ways at her launching at Mare Island Naval Shipyard on 16 January 1965. USN photo # MSA 66284-1-65,courtesy of Darryl L. Baker. 602k Kamehameha (SSBN-642) bow just touches water at the end of the ways. USN photo # MSA 663285-1-65, courtesy of Darryl L. Baker. 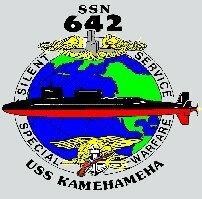 958k The Kamehameha (SSBN-642) is at the end of the ways. USN photo # MSA 66286-1-65,courtesy of Darryl L. Baker. 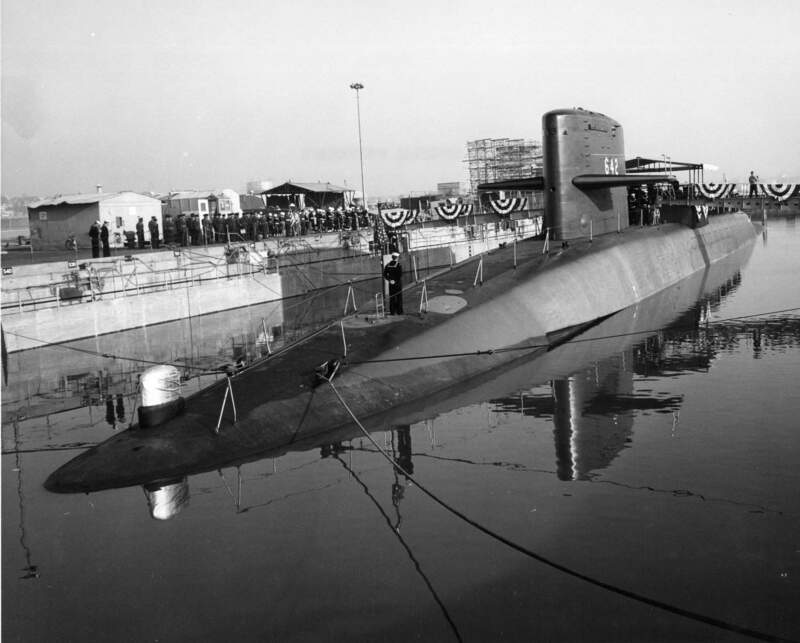 232k The Kamehameha (SSBN-642) is waterborne after her launching at Mare Island Naval Shipyard on 16 January 1965. USN photo # 66345-1-65, courtesy of Darryl L. Baker. 195k A broadside view of the Kamehameha (SSBN-642) after her launching at Mare Island Naval Shipyard on 16 January 1965. 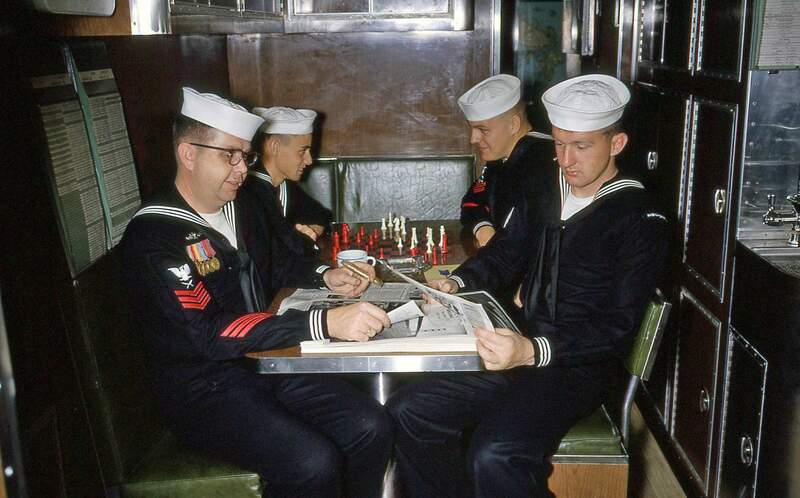 USN photo # 66289-1-65, courtesy of Darryl L. Baker. 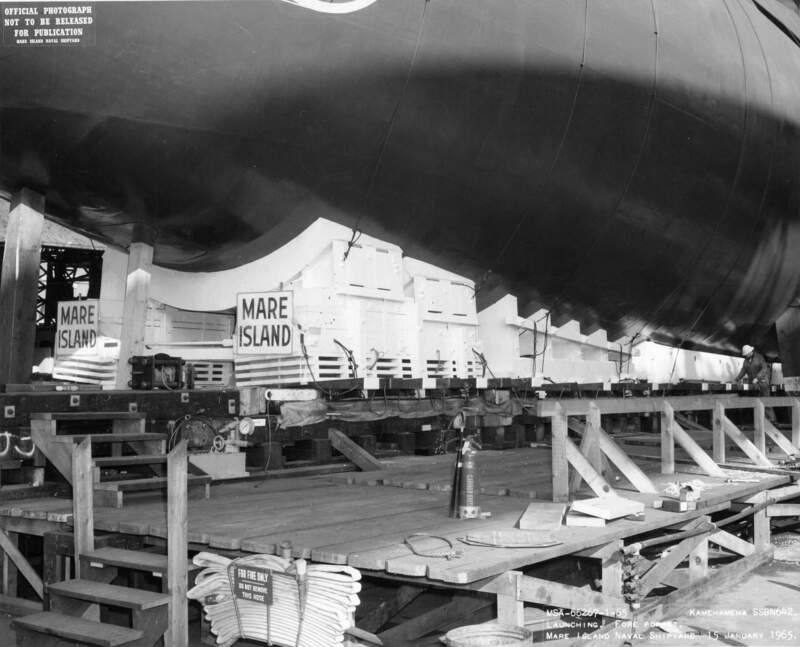 242k Kamehameha (SSBN-642) is seen in dry dock 3 at Mare Island on 16 January 1965 after her launch. She was in dock to drop her launching cradle. USN photo courtesy of Darryl L. Baker. Photo scanned from original negatives courtesy of By Design, Benicia, CA. 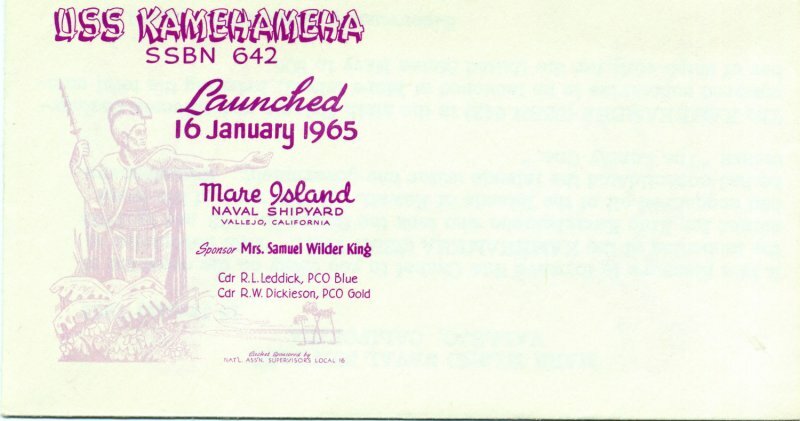 242k Cover of the launching program of the Kamehameha (SSBN-642) on 16 January 1965. Photo courtesy of Dale Hargrave. 899k Kamehameha (SSBN-642) at her outfitting berth at Mare Island on 1 July 1965. USN photo # MSA 68808-7-65, courtesy of Darryl L. Baker. 200k A sabot is fired from one of Kamehameha's (SSBN-642) missile tubes at Mare Island Naval Shipyard on 22 August 1965 while she was being outfitted. USN photo # MSA 69846-8-65,courtesy of Darryl L. Baker. 583k Kamehameha (SSN-642) conducting emergency blow test at Mare Island on 11 October 1965. USN photo # 70103-10-65, courtesy of Vallejo Naval and Museum via Darryl L. Baker. 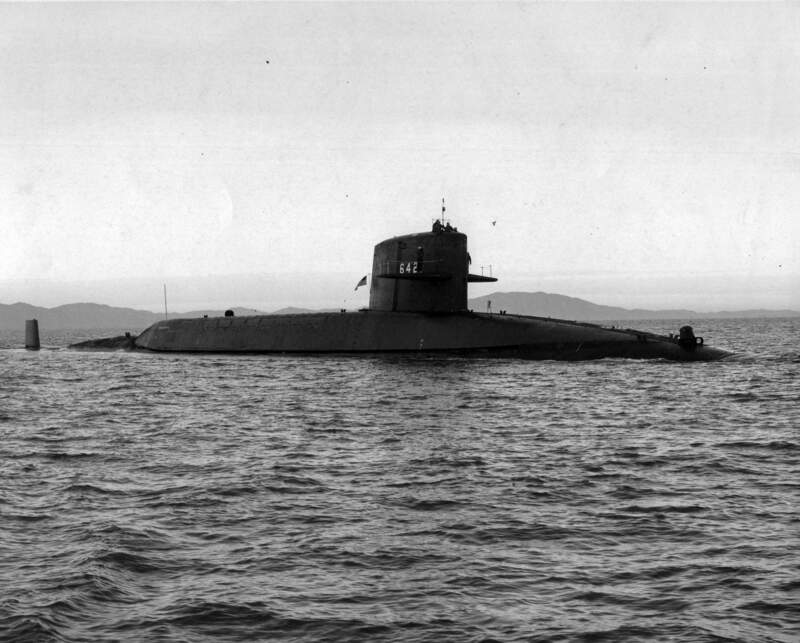 1.10k Kamehameha's (SSBN-642) on builder trials on 5 November 1965. USN photo # 70426-11-65 TH courtesy Vallejo Naval and Historical Museum via Darryl L. Baker. 733k The submarines' commanding officer and ship's sponsor are seen at the reception following the Kamehameha's (SSBN-642) commissioning at Mare Island on 10 December 1965. 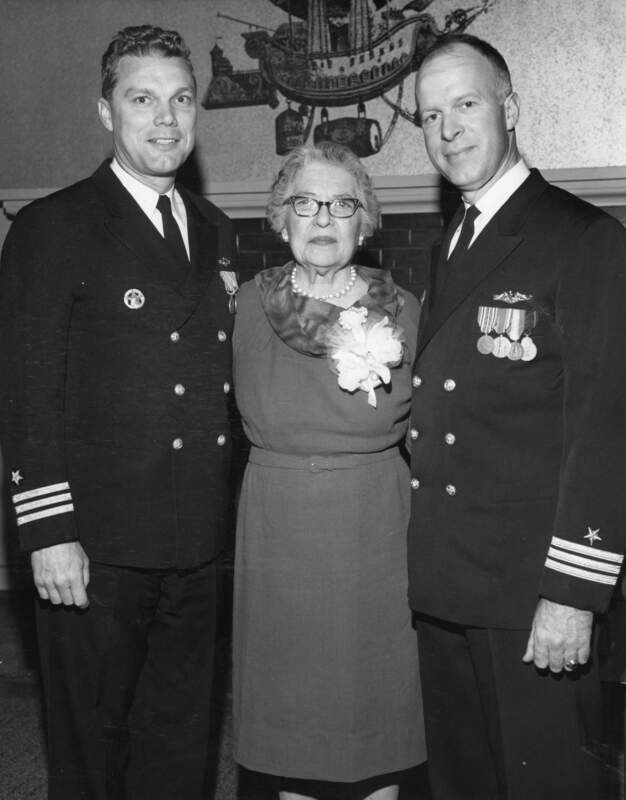 Left to right: CDR R. W. Dickieson (Gold), Mrs. Samuel Wilder King (Ship's Sponsor) and CDR Roth S. Leddick (Blue). USN photo # 70915-12-65 TH courtesy Vallejo Naval and Historical Museum via Darryl L. Baker. 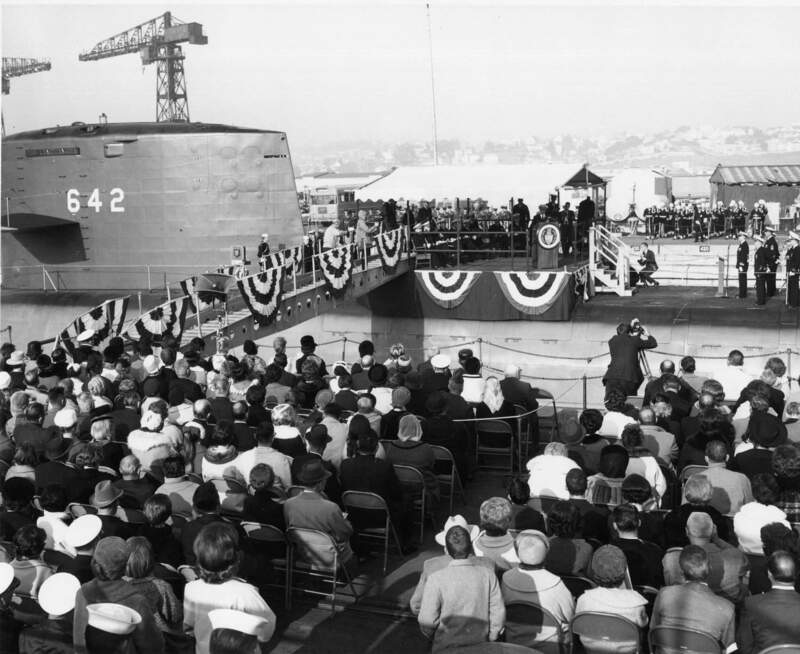 264k RADM Eugene B. Fluckey (COMSUBPAC) speaks at the commissioning of the Kamehameha (SSN-642) at Mare Island on 10 December 1965. USN photo #70910-12-65 from the Vallejo Naval and Historical Museum courtesy of Darryl L. Baker. 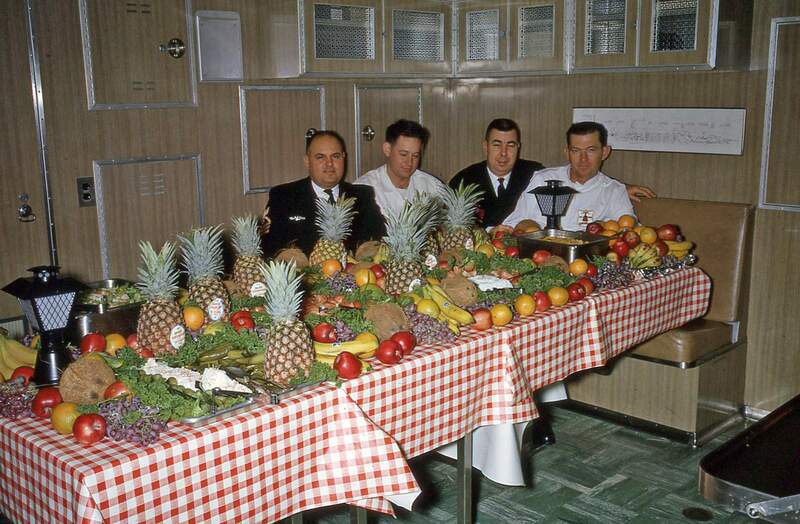 315k The senior enlisted cooks of the Kamehameha (SSN-642) are ready for the commissioning luncheon at Mare Island on 10 December 1965. USN photo courtesy of Darryl L. Baker. 278k Mess decks crew of Kamehameha (SSN-642) at Mare Island on 10 December 1965. USN photo courtesy of Darryl L. Baker. 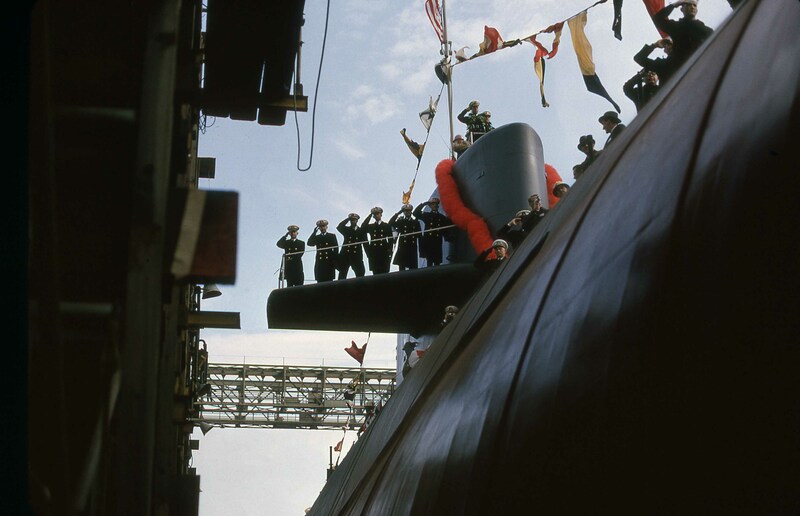 241k Four crew members are waiting on the mess decks for the submarine's commissioning at Mare Island on 10 December 1965. USN photo courtesy of Darryl L. Baker. 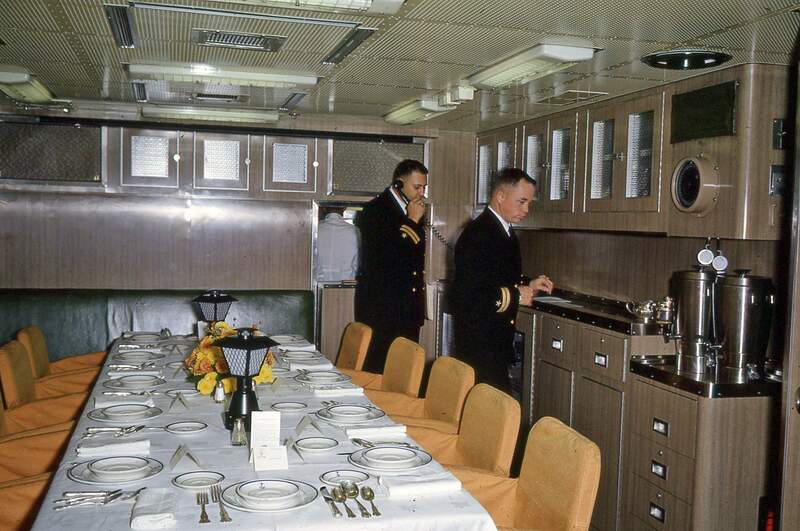 233k Crew member in berthing compartment aboard Kamehameha (SSN-642) on the day of her commissioning at Mare Island on 10 December 1965. USN photo courtesy of Darryl L. Baker. 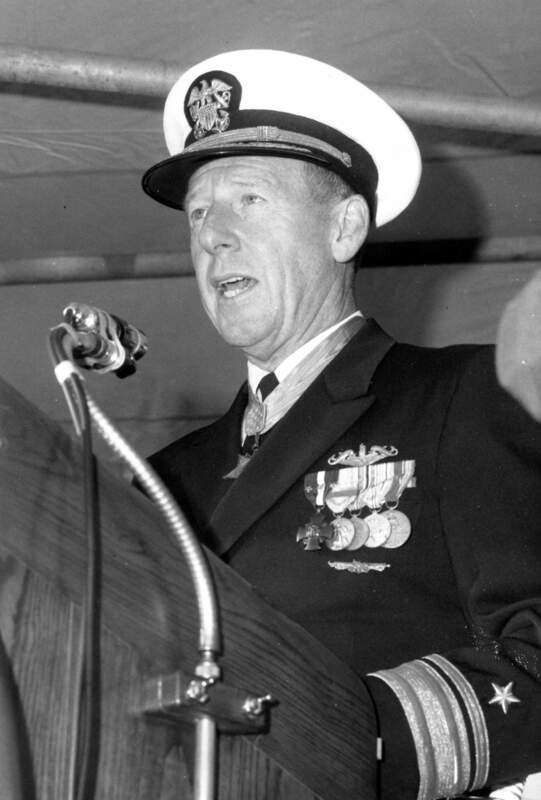 242k Department heads and Commanding Officer of the Gold Crew, CDR Robert W. Dickieson, USN standing by in the wardroom for the submarine's commissioning at Mare Island on 10 December 1965. USN photo courtesy of Darryl L. Baker. 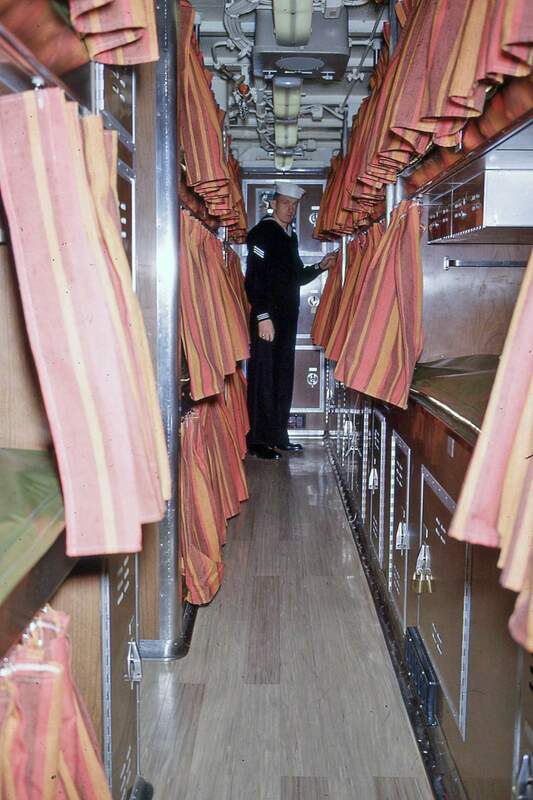 297k Two officer waiting in the wardroom for the submarine's commissioning at Mare Island on 10 December 1965. USN photo courtesy of Darryl L. Baker. 154k Bow view of Kamehameha (SSBN-642) in dry dock #3 at Mare Island Naval Shipyard on 10 December 1965 during her commissioning. USN photo # MSA 70893-12-65, courtesy of Darryl L. Baker. 197k Stern view of Kamehameha (SSBN-642) in dry dock #3 at Mare Island Naval Shipyard on 10 December 1965 during her commissioning. USN photo # MSA 70895-12-65, courtesy of Darryl L. Baker. 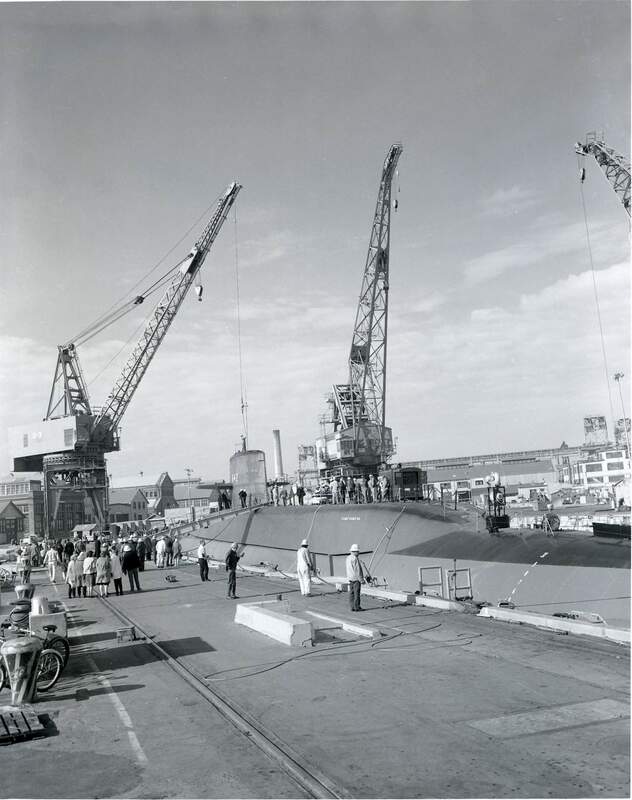 200k View of the Kamehameha (SSBN-642) in dry dock #3 at Mare Island Naval Shipyard on 10 December 1965 during her commissioning. USN photo # MSA 70896-12-65,courtesy of Darryl L. Baker. 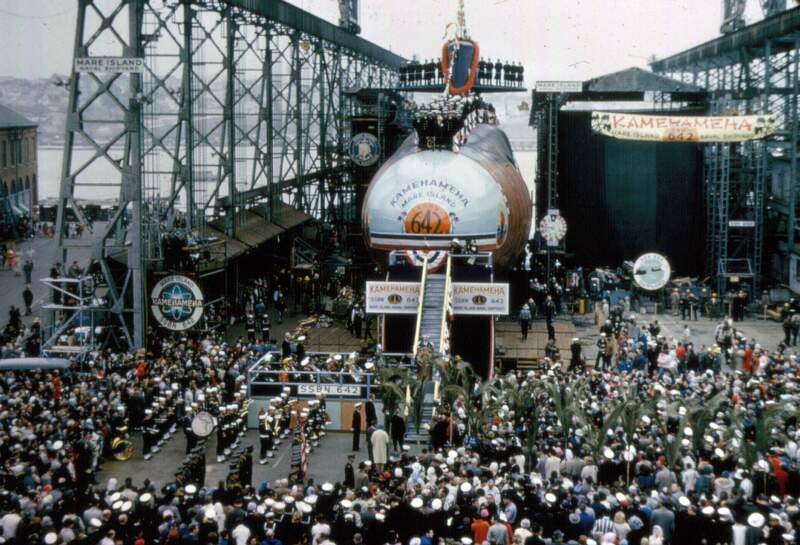 166k Honors are rendered to ADM Roy L. Johnson, Commander-in-Chief, US Pacific Fleet during the commissioning ceremony for the Kamehameha (SSBN-642) at Mare Island on 10 December 1965. USN photo # MSA 70897-12-65, courtesy of Darryl L. Baker. 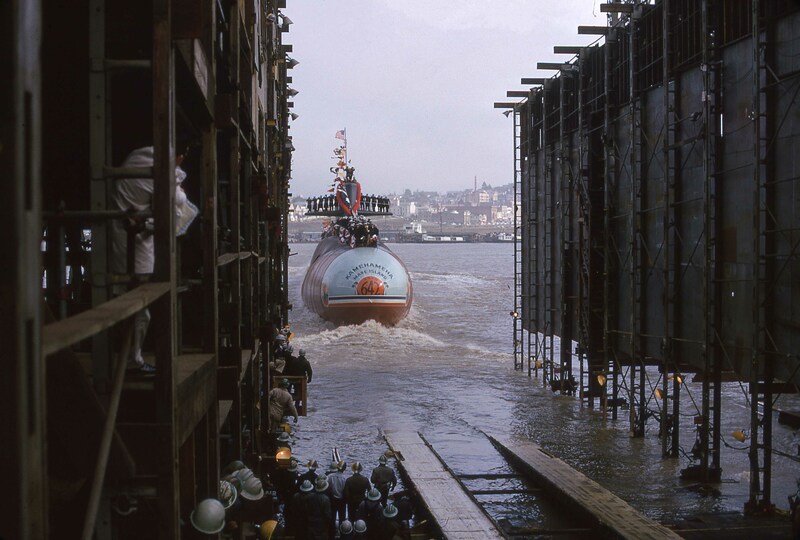 195k Colors are raised aboard the Kamehameha (SSBN-642) in dry dock #3 at Mare Island Naval Shipyard on 10 December 1965 during her commissioning. USN photo # MSA 70902-12-65, courtesy of Darryl L. Baker. 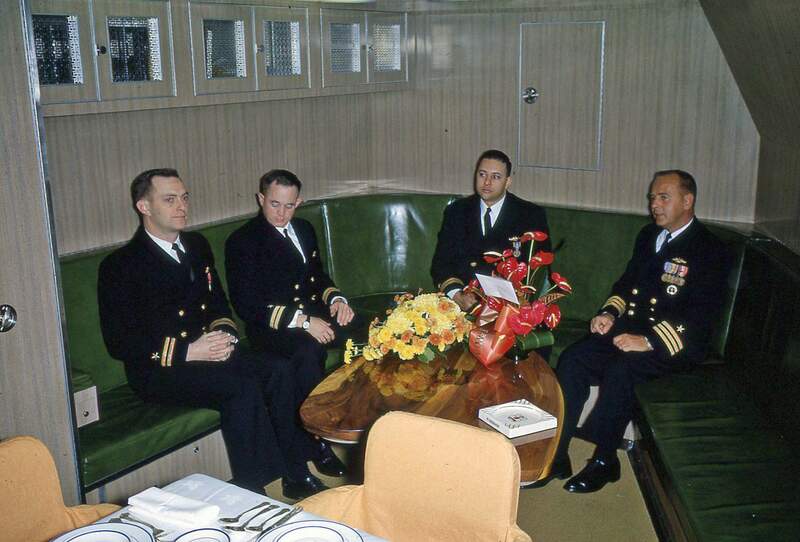 53k Commissioning party for the Kamehameha (SSBN-642) at Mare Island on 10 December 1965; from left to right Radm Edward J. Fahy (Shipyard Commander), CDR Robert W. Dickieson (CO Gold Crew), CDR Roth S. Leddick (CO Blue Crew), and LCDR Charles H. Pitts, CHC, USN. USN photo # MSA 70912-12-65,courtesy of Darryl L. Baker. 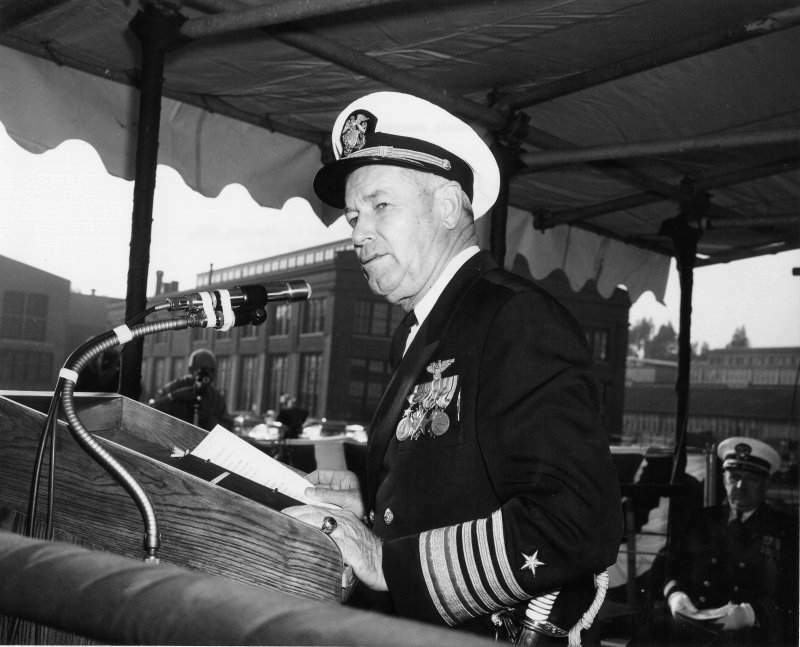 50k ADM Roy L. Johnson, Commander-in-Chief, U.S. Pacific Fleet addresses the guests at the commissioning of Kamehameha (SSBN-642) at Mare Island on 10 December 1965. USN photo # 70909-12-65, courtesy of Darryl L. Baker. 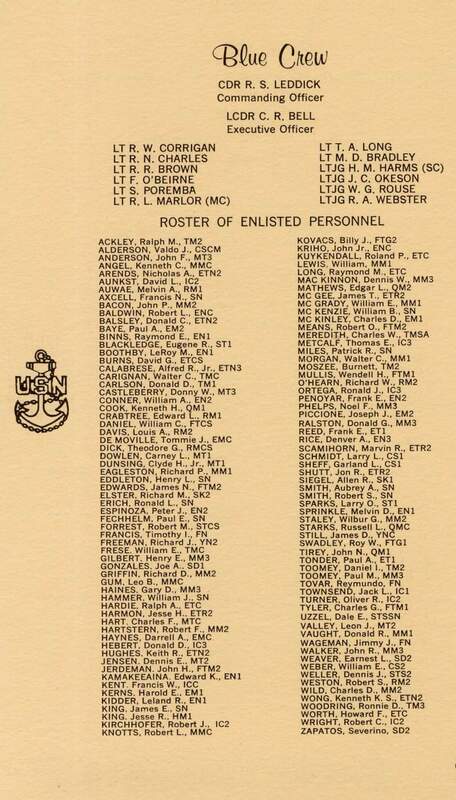 169k Crew list of Kamehameha (SSBN-642) Gold Crew at the time of commissioning. USN photo courtesy of Darryl L. Baker. 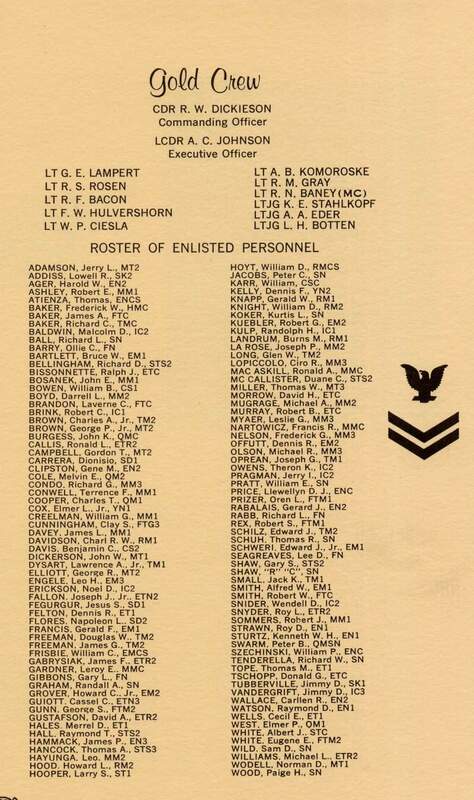 169k Crew list of Kamehameha (SSBN-642) Blue Crew at the time of commissioning. USN photo courtesy of Darryl L. Baker. 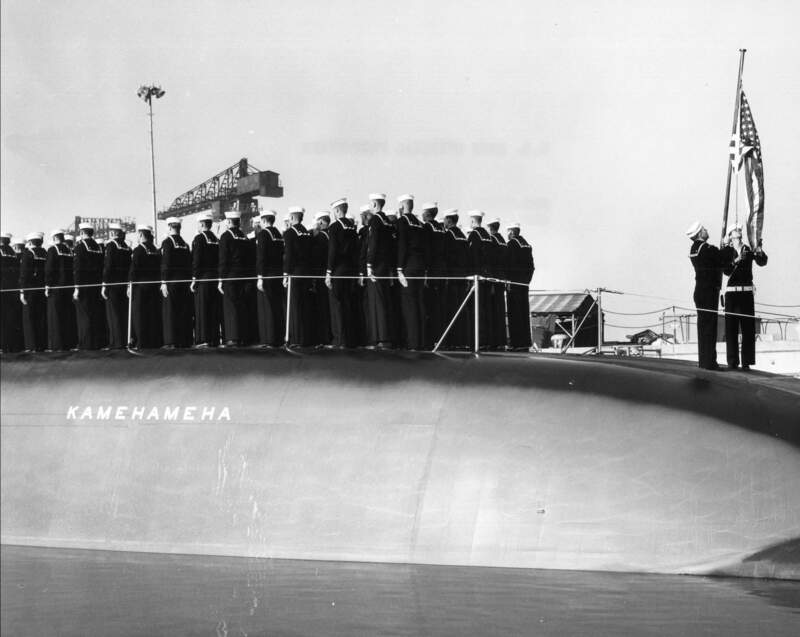 22k Commemorative post mark on the occasion of the Kamehameha's (SSBN-642) commissioning, 10 December 1965. Courtesy of Frank Cramer. 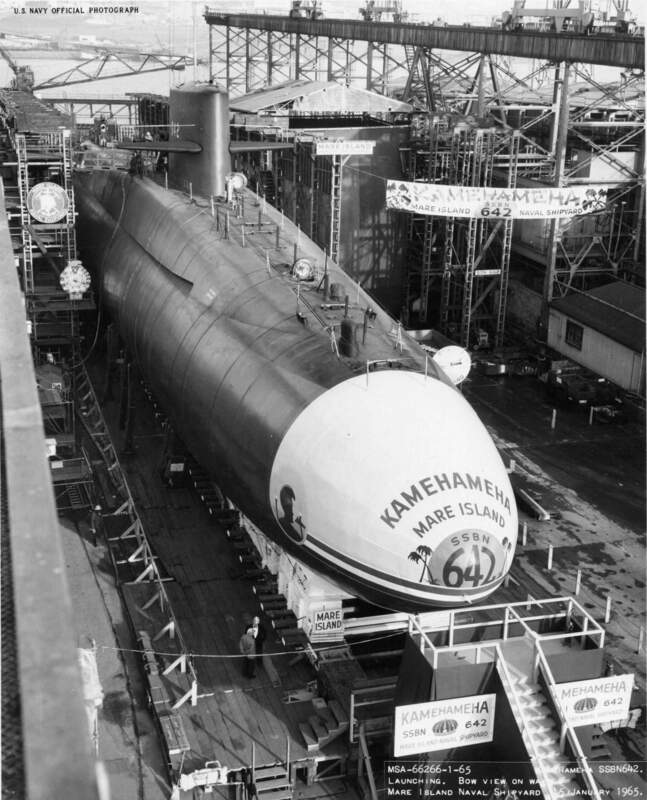 835k The crew of Kamehameha (SSBN-642) thank Mare Island's senior civilian managers for the delivery of the submarine in March 1966. Upper portion of photo from left to right are: CDR R. W. Dickieson (PCO, Gold Crew), Mr. Irve Witthorne, ENCS(SS) T. Atienza (COB), Mr. E. Martinez, and CDR R. S. Leddick (PCO, Blue Crew). USN photo # MSA 67045-3-66, courtesy of Darryl L. Baker. 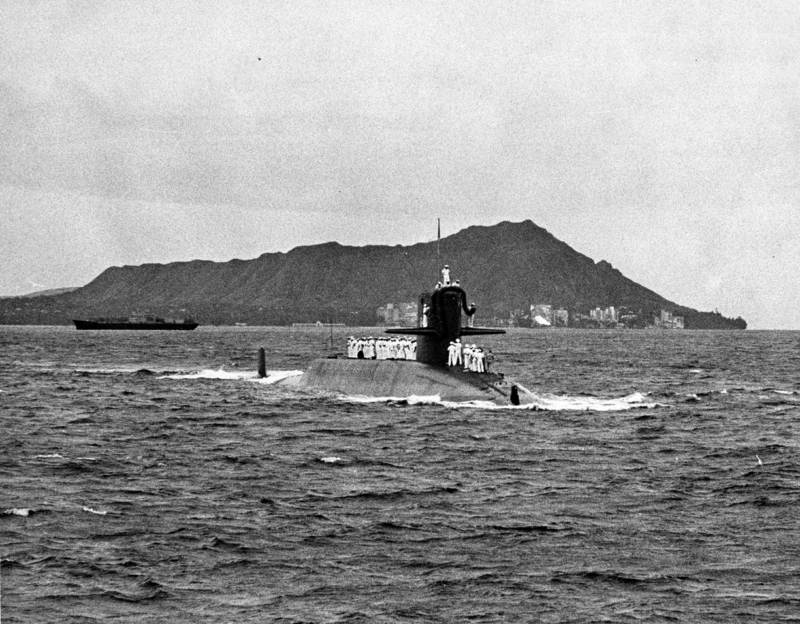 733k Kamehameha (SSBN-642) off Diamond Head on 10 June 1966. USN photo courtesy of Vallejo Naval and Historical Museum via Darryl L. Baker. 696k Kamehameha (SSBN-642) on builders trial out of Mare Island in November 1966. USN photo # MSA 73885-11-85, courtesy of Darryl L. Baker. 611k James Alvin Sagerholm. According to his bio, as a Lieutenant, he commanded the Rhea (MSCO-52) from July 1956 to 1957. Although he qualified in destroyers (being X.O. 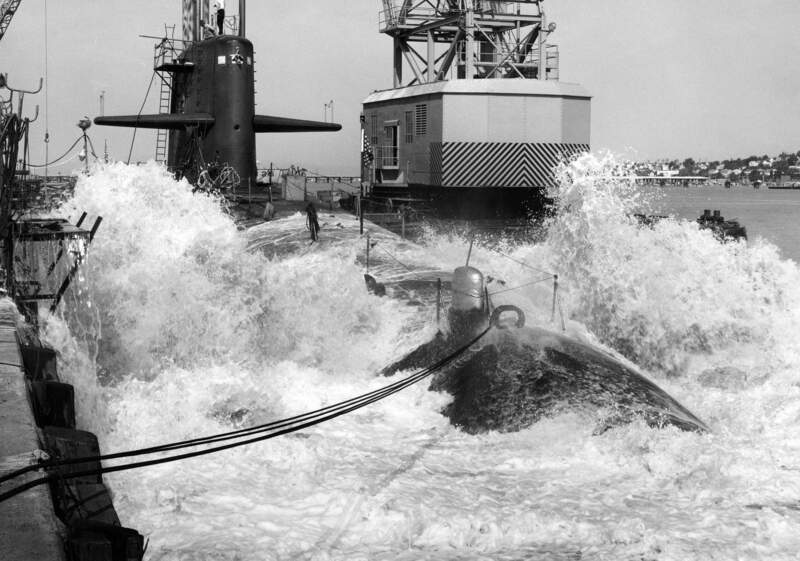 twice) he entered Nuclear Training to eventually become skipper of the Kamehameha (SSN-642) from July 1968 to May 1971. 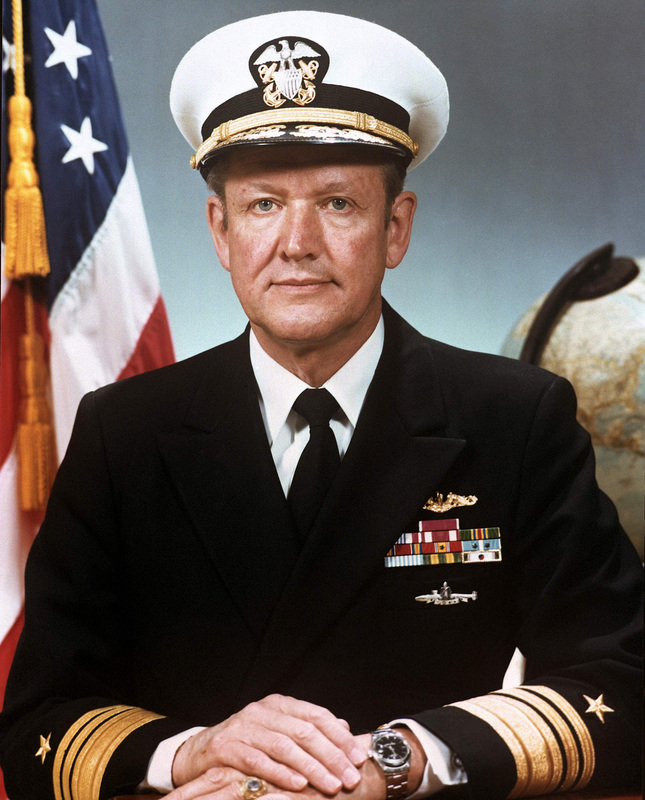 He appears here as a Vice Admiral. Text & USN photo # DN-SC-83-06877 from the Department of Defense Still Media Collection, courtesy of dodmedia.osd.mil. & submitted by Bill Gonyo. 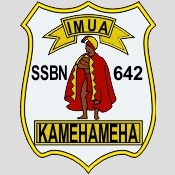 1.14k Fourteen page PDF Welcome Aboard pamphlet of the Kamehameha (SSBN-642). USN photo courtesy of Scott Koen & ussnewyork.com. 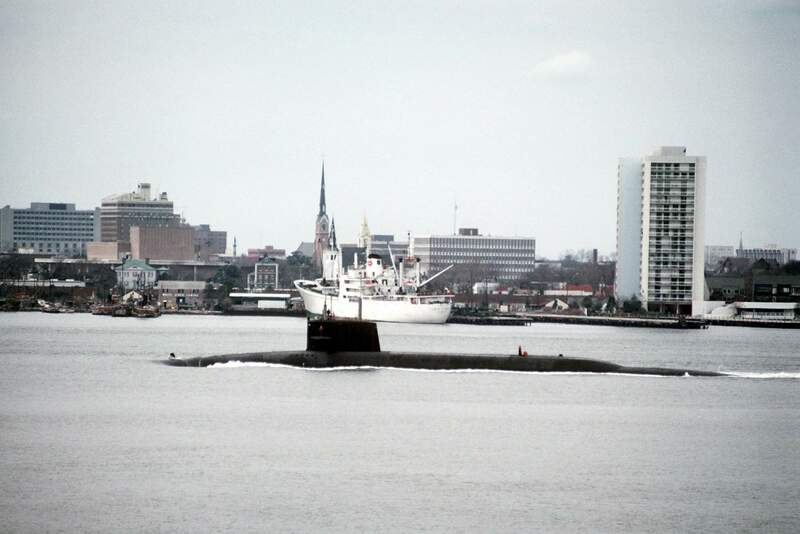 173k A port beam view of the nuclear-powered strategic missile submarine Kamehameha (SSN-642) underway in the harbor as it departs Naval Station, Charleston, S.C., on 21 February 1984. USN photo # DN-ST-90-08295, by Don S. Montgomery, from the Department of Defense Still Media Collection, courtesy of dodmedia.osd.mil. & submitted by Bill Gonyo. 54k Kamehameha (SSN-642) & tender Hunley (AS-31), with the Harbor Tug Natick (YTB-760) coming alongside in Holy Loch, Scotland, circa 1985. Courtesy of Jack Treutle & kamfish.com. 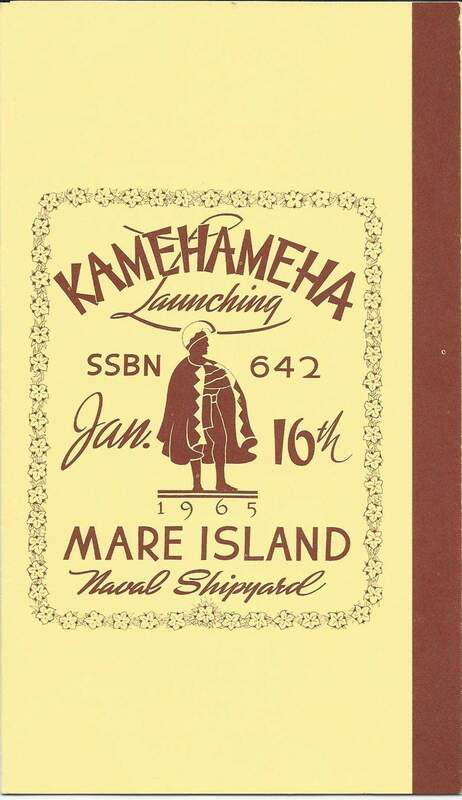 714k Eight page PDF Welcome Aboard pamphlet of the Kamehameha (SSN-642). USN photo courtesy of Scott Koen & ussnewyork.com. 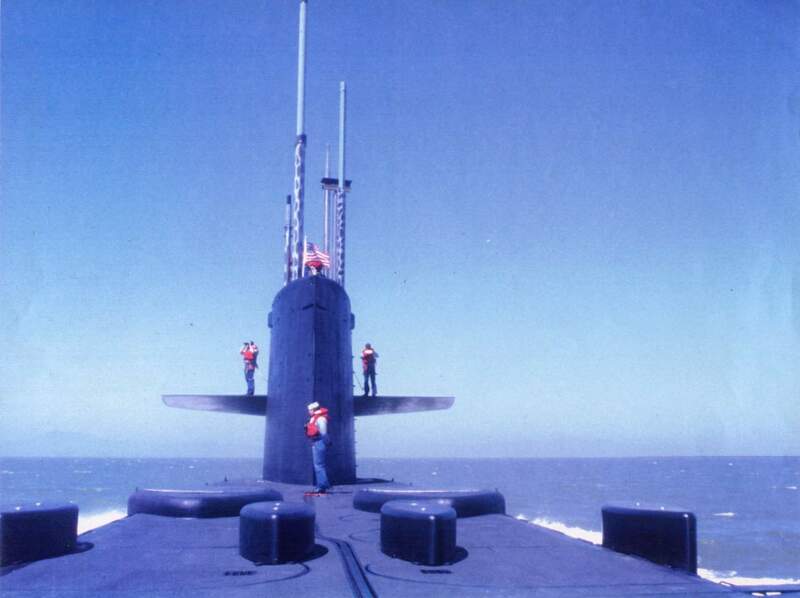 119k The Kamehameha (SSN-642) returns to Mare Island after completing sea trials in July 1993. 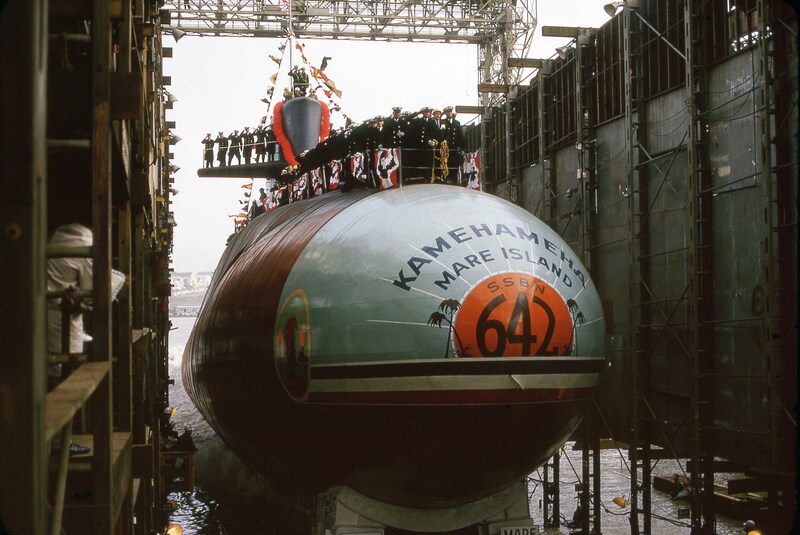 Kamehameha was converted to a SSN at Mare Island from 24 September 1992 and 23 July 1993. USN photo courtesy of Darryl L. Baker. 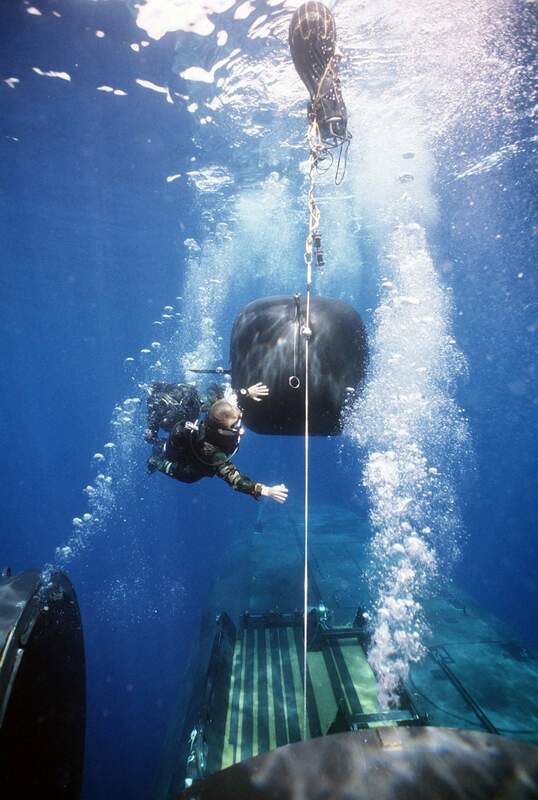 575k A SEAL Swimmer ascends from the nuclear-powered submarine Kamehameha (SSN-642) to the surface breathing on a "pony" SCUBA bottle. 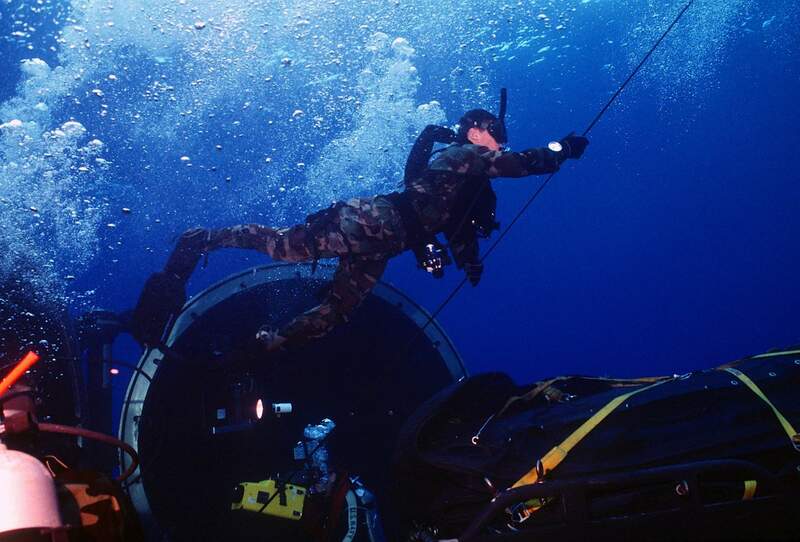 The SEAL will board the collapsible rigid rubber craft which has already been deployed, 1 November 1993. USN photo photo # DN-ST-95-00316, by LCDR. Mike Wood, courtesy of dodmedia.osd.mil. 147k Kamehameha (SSN-642) with Dual Dry Deck Shelters installed for SEAL Team Lockout Operations Taken during swim call off Ewa Beach Hawaii in 1994. Photo by RMC(SS) Tony Christopher. 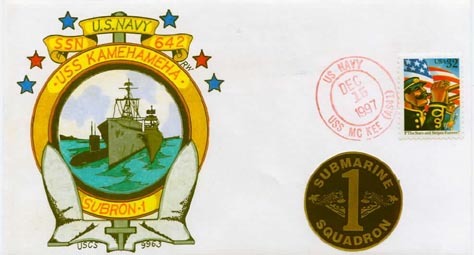 40k Commemorative post mark on Kamehameha's (SSN-642) tour of duty with Submarine Squadron 1, 1997. Photo courtesy of Jack Treutle (of blessed memory). 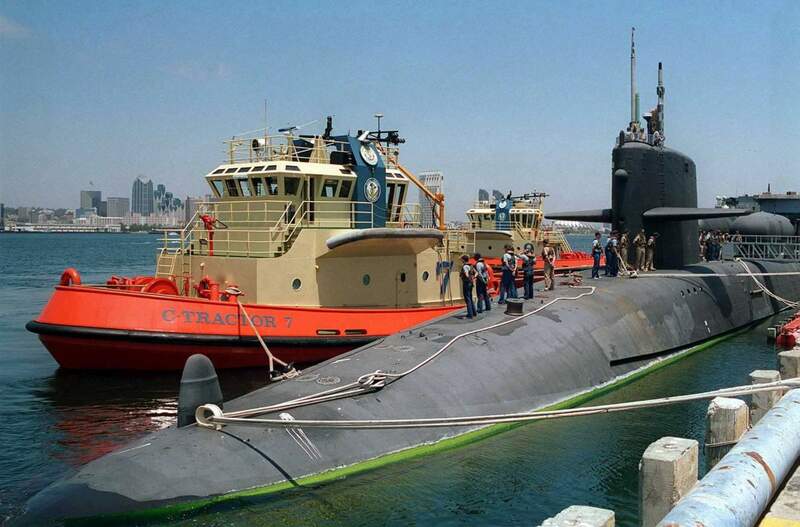 372k With the help of the C-Tractor 7, a Choest Marine owed tug, Kamehameha (SSN-642) prepares to depart NAS North Island to support Exercise Kernel Blitz '97 at Camp Pendleton, California on 16 June 1997. 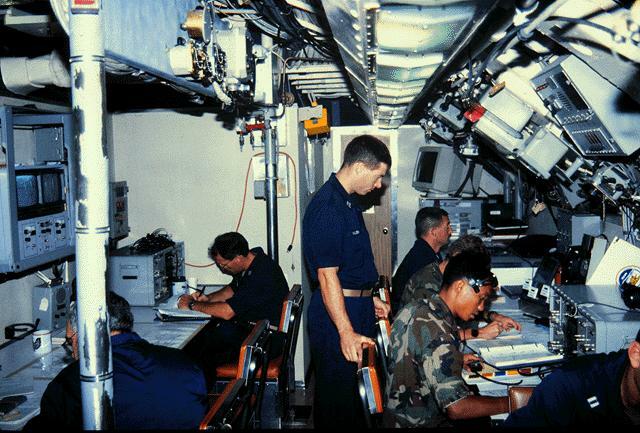 Kernel Blitz '97 is a bi-annual Commander-in-Chief Pacific (CINCPAC) fleet training exercise (FLEETEX) focused on operational/tactical training of Commander, Third Fleet (C3F)/ I Marine Expeditionary Forces (MEF) and Commander, Amphibious Group 3 (CPG-3)/ 1st Marine Division (MARDIV). Kernel Blitz '97 is designed to enhance the training of Sailors and Marines in the complexities of brigade-size amphibious assault operations. USN photo # DN-SD-03-04700 by JO2 Craig P. Strawser,from the Defense Visual Information Center, courtesy of dodmedia.osd.mil. 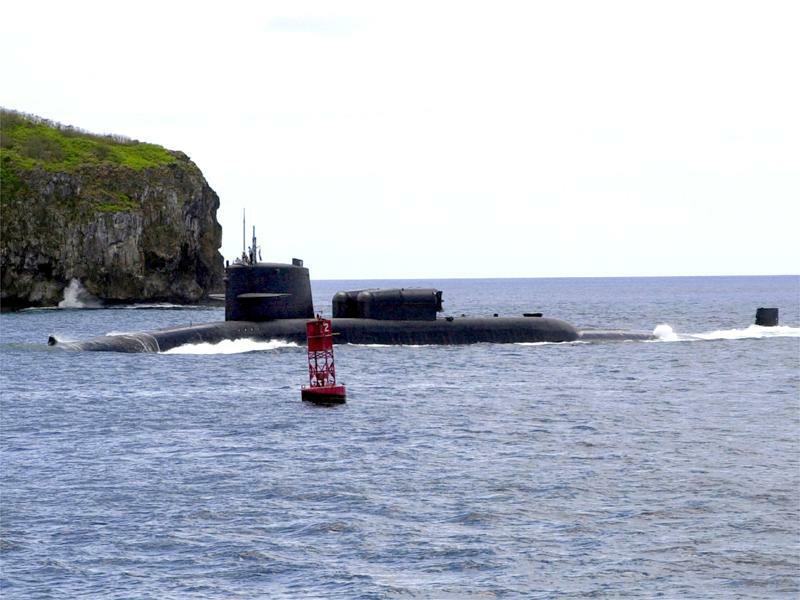 67k Kamehameha (SSN-642), glides past Orote Point through Apra Harbor, Guam, 13 April 2001. The ballistic missile submarine converted to a conventional submarine in July 1992. She is equipped with two dry deck shelters (DDS) to support Navy SEALS and SEAL Delivery Vehicles during special operations. USN photo # N-9885M-003, by PH1 Alan D. Monyelle USN. US Navy Chinfo Ship Images. 211k A life size portrait of Retired Rear Admiral Michael Browne painted in oil on linen by the artists Kevin Murphy & Kathleen Fritz. 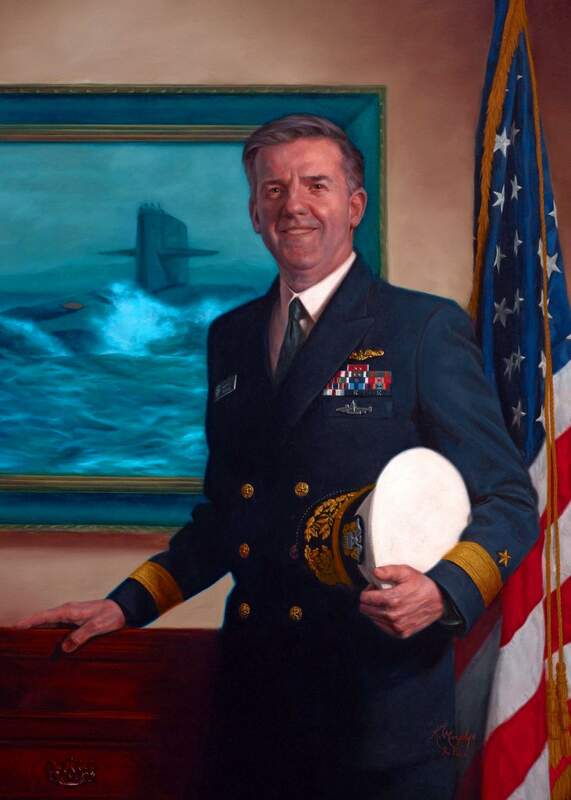 Admiral Browne expressed during his sitting for this portrait that the early days on the Kamehameha (SSN-642) were the best times of his career. Photo courtesy of Kevin Murphy, Founder, Art Academy of Hillsborough. Copyright for the painting: Kevin Murphy & Kathleen Fritz. 86k The Kamehameha (SSN-642) makes her way off the coast of Hawaii in this undated photo. USN photo courtesy of pelicanharborsubvets.com. 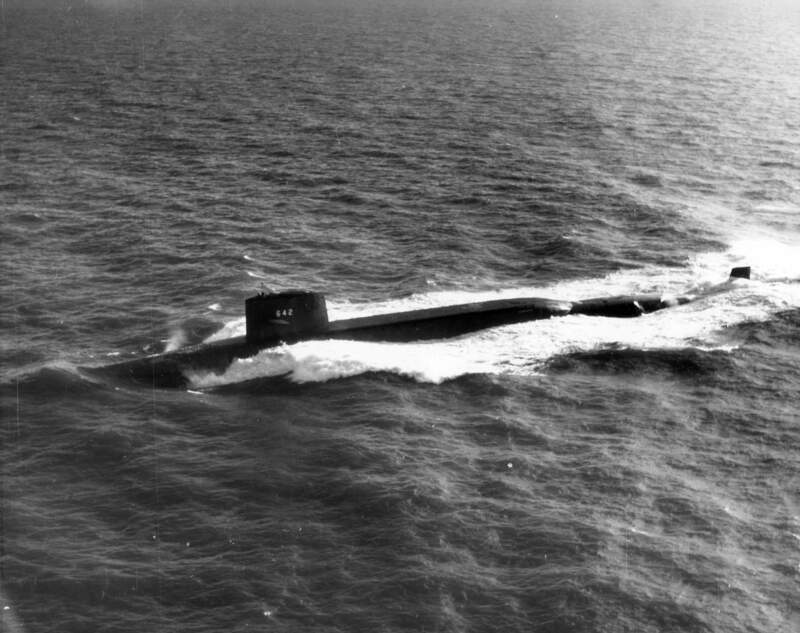 98k Kamehameha (SSN-642) underway. USN photo courtesy of COMSUBGRU Nine web site. 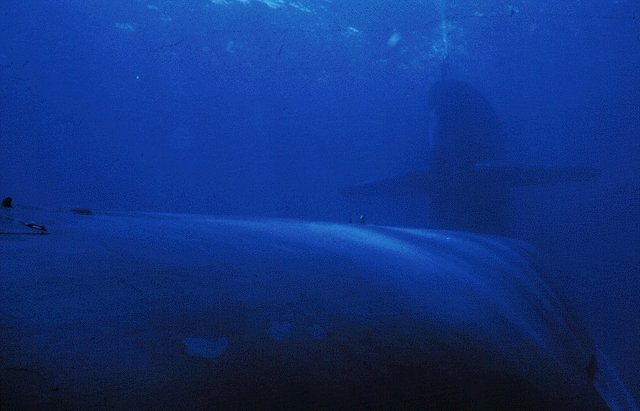 33k Kamehameha (SSN-642) underway submerged. USN photo courtesy of COMSUBGRU Nine web site. 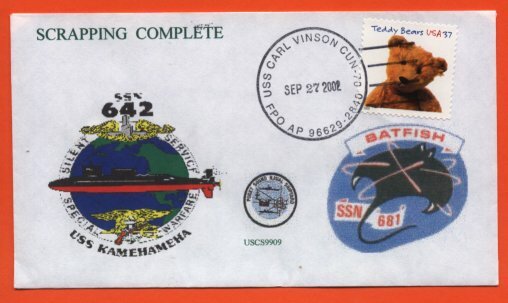 64k Commemorative post mark from Kamehameha's (SSN-642) visit to Aqaba, Jordan, 26 April 2000, on the occasion of the first sub that visited that country. Photo courtesy of Jack Treutle (of blessed memory). 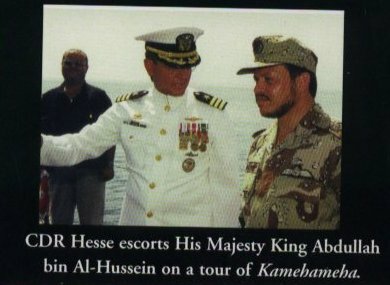 24k Kamehameha's (SSN-642) Commanding Officer, CDR Hesse, escorts King Abdulah of Jordan on a tour of the boat during her visit to Aqaba, Jordan, 26 April 2000. For meritorious service from 1 June to 30 November 1999. 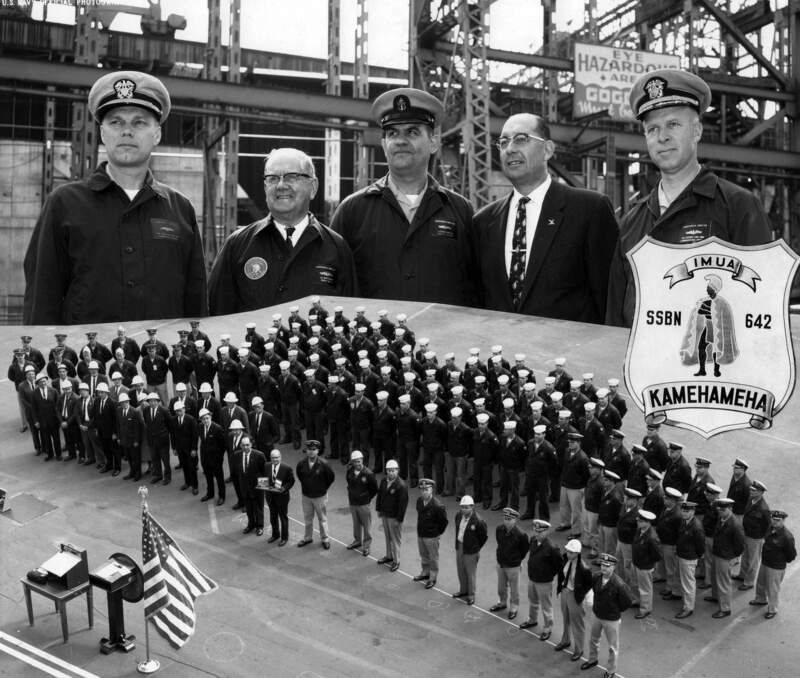 The crew of Kamehameha displayed sustained superior performance during Kamehameha's first ever six month deployment to the Western Pacific, Indian Ocean, and Persian Gulf. 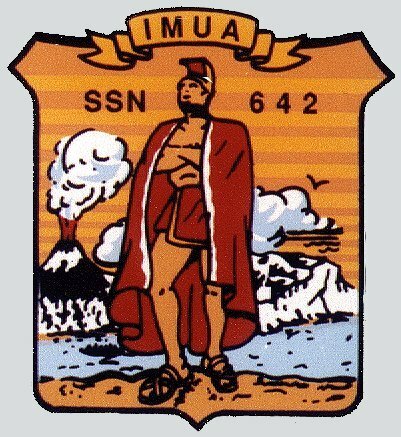 While deployed, the crew of Kamehameha displayed expertise in the area of Naval Special Warfare, completing special missions throughout Asia and the Persian Gulf. Kamehameha's flawless performance during the first ever operational evaluation of SEAL and diver performance during Dry Deck Shelter operations in the extreme warm waters of the Persian Gulf provided special operations forces with invaluable insight and lessons learned in a new and challenging war fighting environment, while clearly demonstrating the ability to conduct special operations in these extreme temperature conditions. Kamehameha operational support of the Kitty Hawk battle group, participation in several high level exercises, as well as the re certification of the ship for independent Dry Deck Shelter operations was completed in superb fashion. In addition, the crew of Kamehameha conducted the first ever port visit of a nuclear powered submarine to Aqaba, Jordan, where they completed several high level onboard visits to include the King of Jordan, as well as the unprecedented completion of six community relations projects. 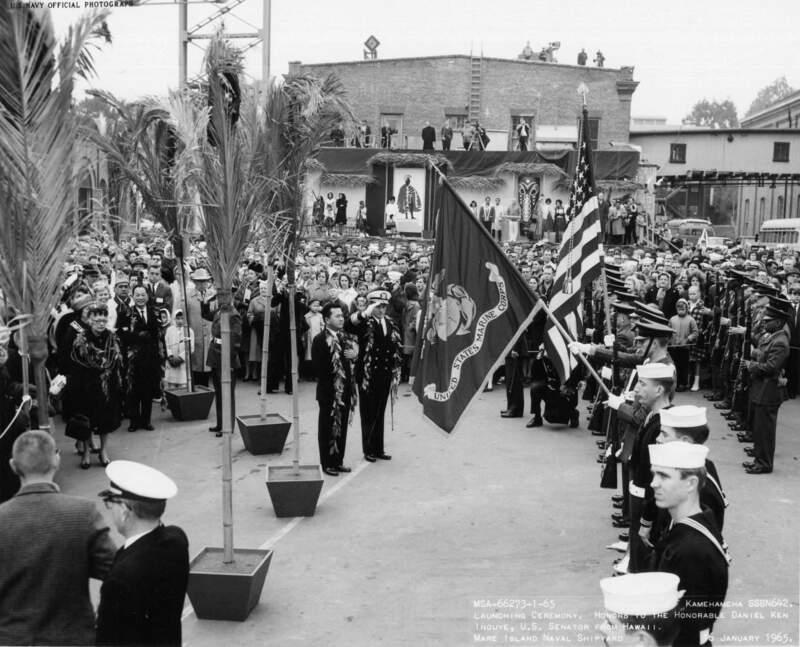 By their unrelenting determination, perseverance, and steadfast devotion to duty, the officers and enlisted personnel of Kamehameha reflected great credit upon themselves and upheld the highest traditions of the United States Naval Service. Chief of Naval Operations Photo courtesy of Jack Treutle (of blessed memory). Text courtesy of Bill Gonyo. 58k Capt. Robert W. Dickieson, the first commanding officer of the Kamehameha (SSN-642) comes aboard during a change of command ceremony, January, 2001. Photo by JO2 Cori Rhea, courtesy of csp.navy.mil. 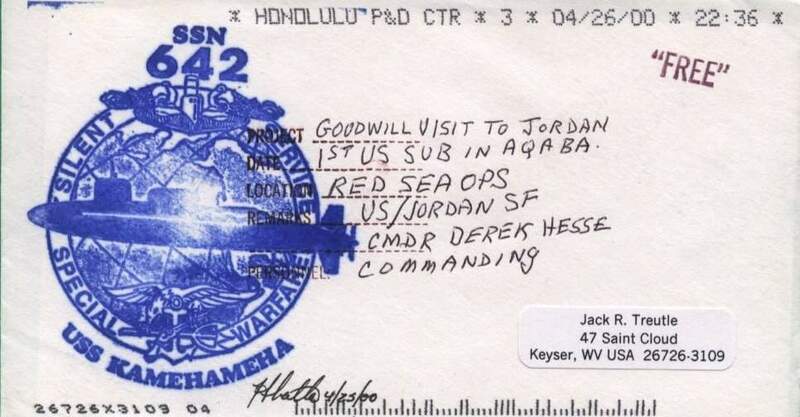 96k Rear Adm. John B. Padgett III, commander of the Pacific Submarine Force, in June, 2001 was off-island for the historic return, but sent a message congratulating the crew on their deployment, and called the return "bittersweet." 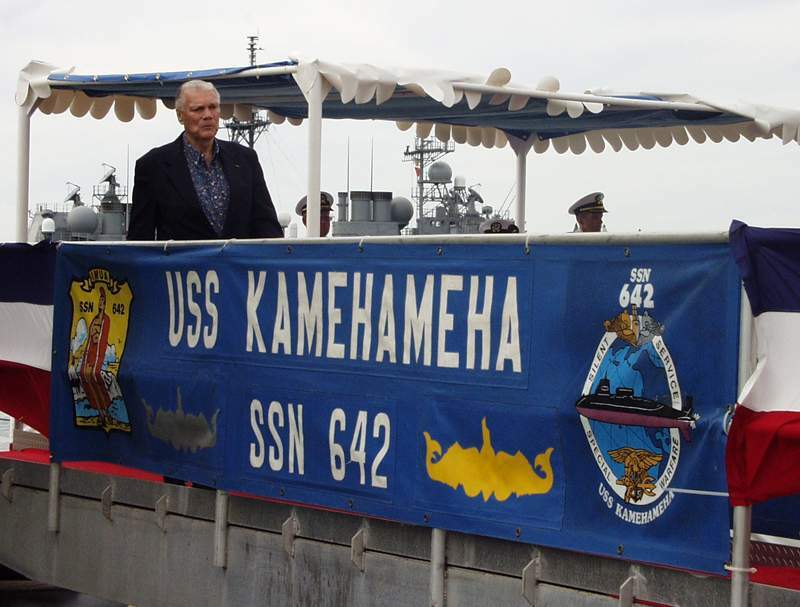 He added that "Kamehameha's (SSN-642) legacy in the Pacific is renowned. For longer than most of the members of her current crew have been alive, this true warrior has helped secure peace for the nation. 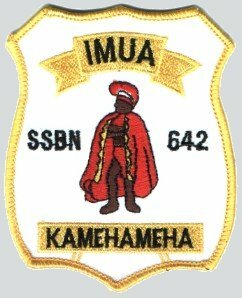 Your crew should take significant pride in knowing that they are the last to join in Kamehameha's regal legacy." USN photo & text courtesy of csp.navy.mil by JO2 Cori Rhea, submitted by Bill Gonyo. 7.48k Twenty three page PDF Inactivation pamphlet of the Kamehameha (SSBN-642). USN photo courtesy of Scott Koen & ussnewyork.com. 250k Senator Daniel Inouye is escorted off the Kamehameha (SSN-642) following inactivation ceremony. Photo by JOCS(SW/AW) Darrell Ames, courtesy of csp.navy.mil. 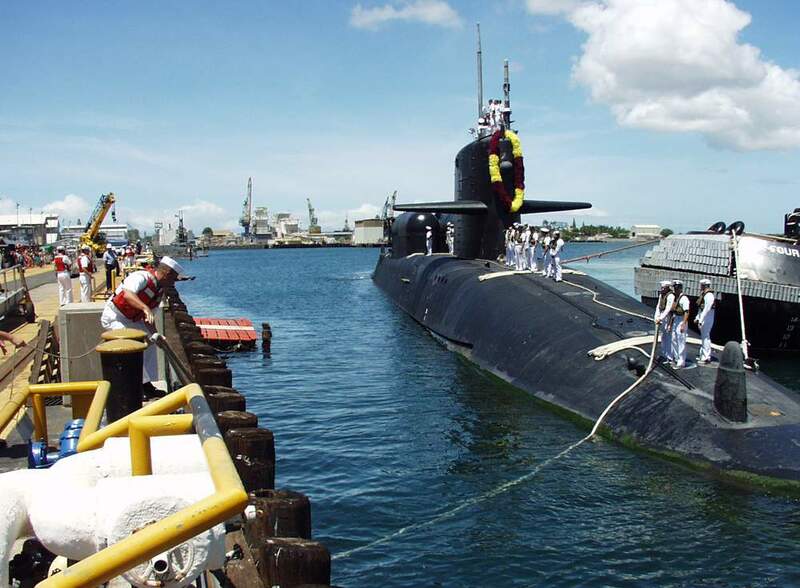 212k Kamehameha (SSN-642) sailors man the rails one last time at her inactivation ceremony, 8 August, 2001. Photo by JOCS(SW/AW) Darrell Ames, courtesy of csp.navy.mil. 228k Kamehameha (SSN-642) receives Royal Hawaiian blessing at her inactivation ceremony, 8 August, 2001. Photo by JOCS(SW/AW) Darrell Ames, courtesy of csp.navy.mil. 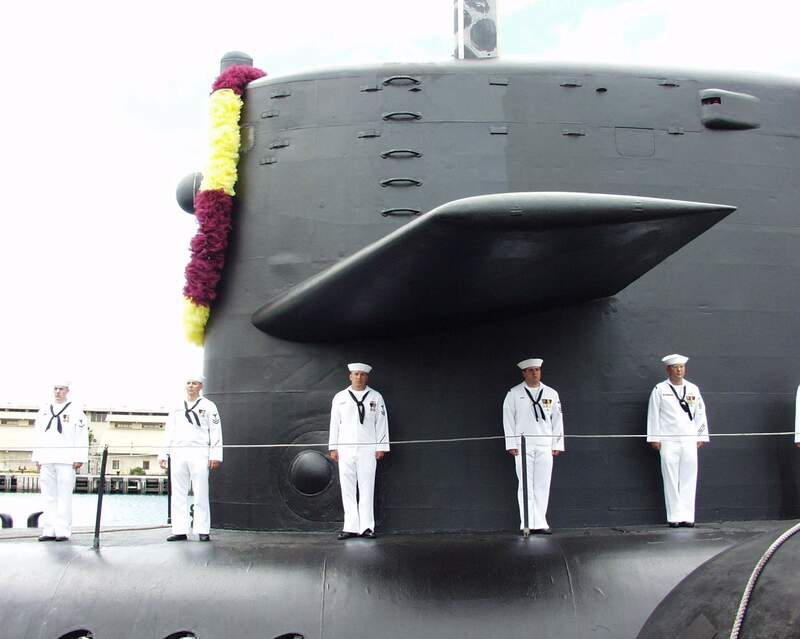 71k Commemorative post mark to Kamehameha's (SSN-642) inactivation ceremony, 8 August, 2001. Photo courtesy of Jack Treutle (of blessed memory). 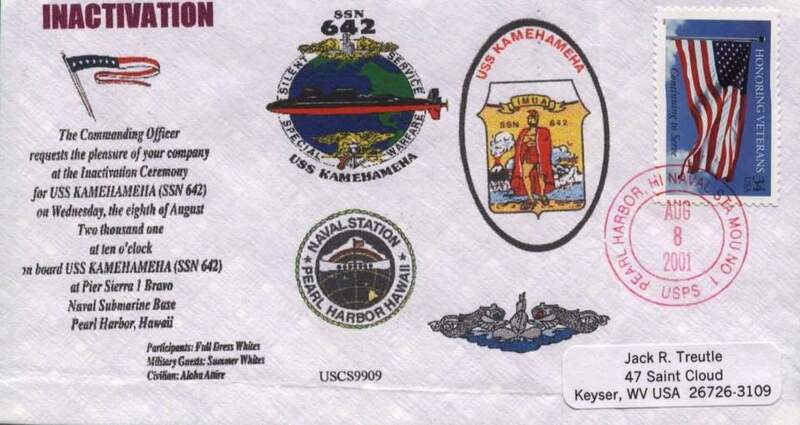 33k Commemorative post mark on Kamehameha (SSN-642) & Batfish (SSN-681) issued after finishing the NPSSRP (Nuclear Powered Ship and Submarine Recycling Program), September 2002. Photo courtesy of Jack Treutle (of blessed memory). 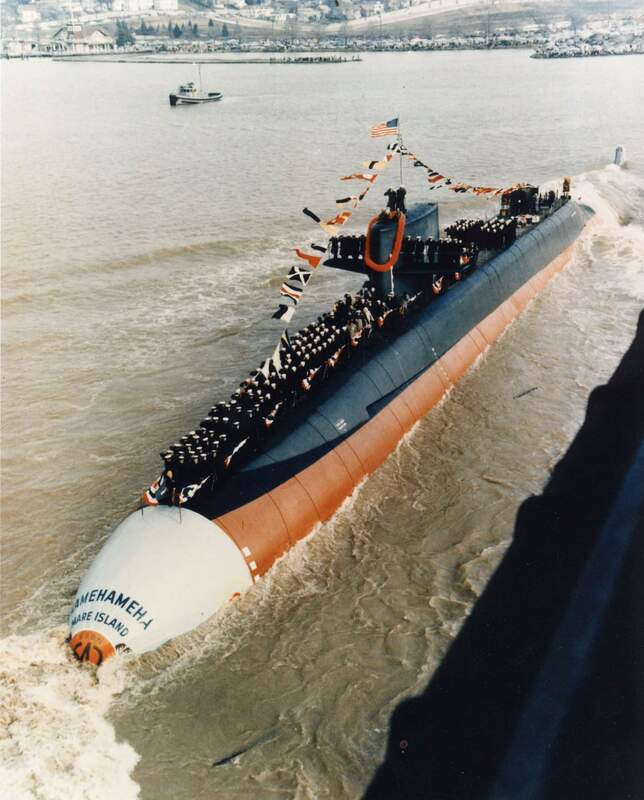 There is no DANFS History currently available for Kamehameha (SSBN/SSN-642) at the Haze Gray & Underway Web Site, the main archive for the DANFS Online Project.